30 June – 22 July, 2016 – In the meantime we had booked our flights back to Europe. Somehow this trip didn’t feel as it should anymore, we didn’t get excited about anything anymore and we felt more and more exhausted. 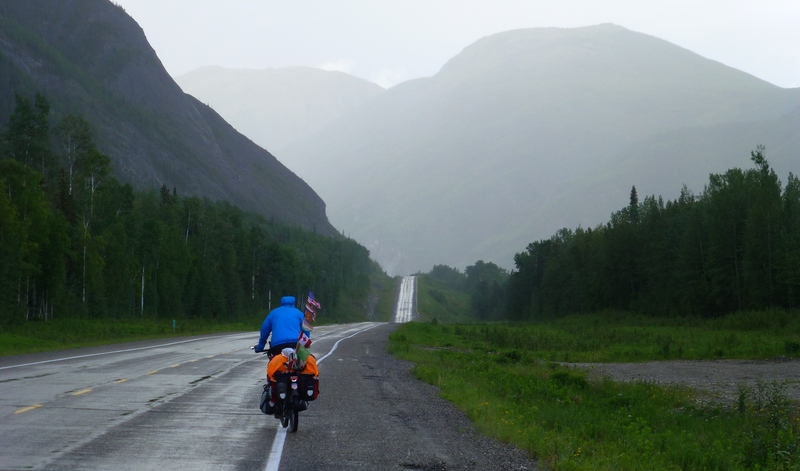 Until lately we had been so lucky with everything – meeting the right people, the weather was mostly as we liked it, we cycled through exciting and diverse landscapes. But the last months were different. We didn’t enjoy anything anymore: not our freedom and not our surroundings. We were tired of travelling and pitching the tent every day somewhere else in the rain and the cold. The few people we met weren’t really what we had expected and hoped for. On top we both became quite depressive – usually we were able to motivate each other as one usually was better off, but that was different this time. And as we were not on a race nor had to prove ourselves that we are the tough guys we booked flights back to Europe. But until then we still had a few weeks to enjoy cycling – as that was something we really enjoyed: being outside and pedalling. 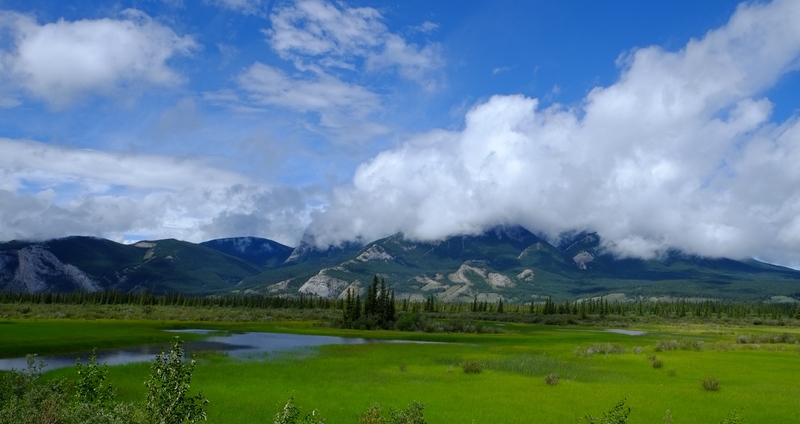 We were now headed towards Jasper and Banff National Park. 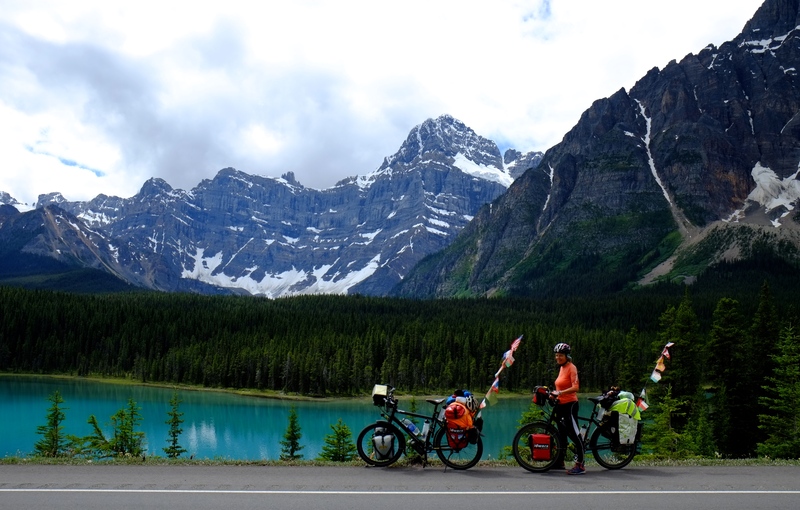 Not realising that it was Canada weekend and usually everyone takes this long weekend off we were pedalling with thousands of motorised tourists into the park. The views were beautiful but the traffic horrendous. We also didn’t realise that it was quite expensive to enter the park and that we had to pay the same fees as the cars as you are paying by head and not vehicle. Even worse we were told that all campsites are full and that there is no way we could get a camp spot anywhere. While we were discussing what to do one of the park rangers approached us and offered us to camp next to their cabin besides a campsite. 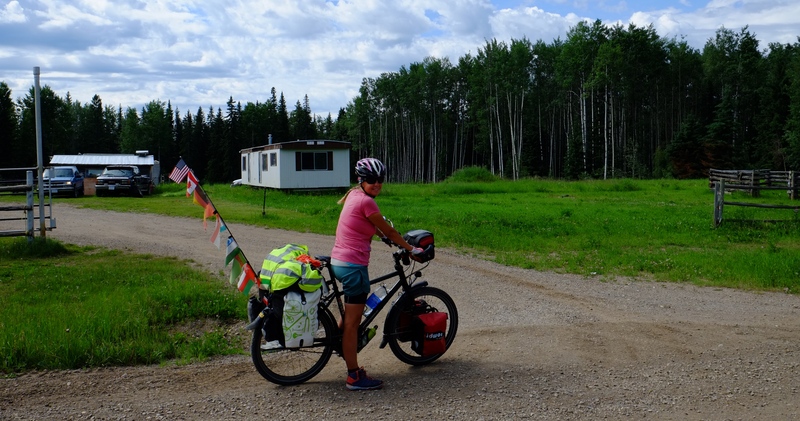 We happily accepted and cycled to said campsite only to hear that a black bear has been regularly visiting the site lately and that we needed to be very careful. Nonetheless we pitched our tent next to the rangers’ cabin and felt so lucky as we could warm up ourselves inside and even used their kitchen and bathroom while it rained cats and dogs outside. It rained all night but our tent luckily stayed dry inside. By 10am the sun had managed to push back the clouds and we moved on. 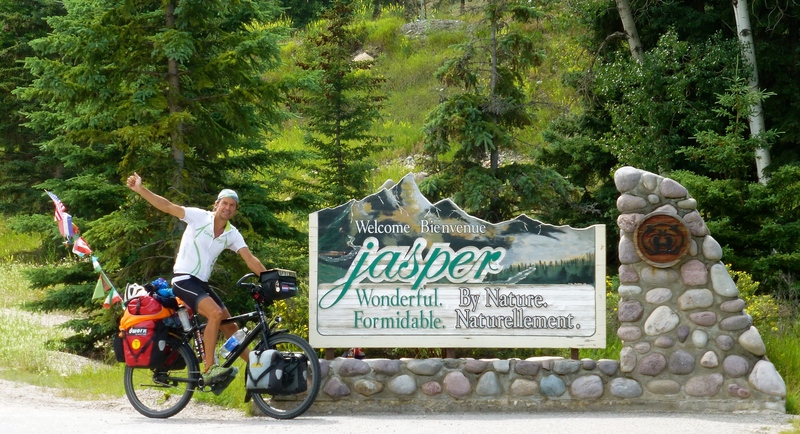 Next stop was Jasper where we wanted to stay a few days to make some day trips into the wilderness. The landscape within the park was absolutely beautiful and we tried to not get upset about all these many cars passing by. Suddenly we saw a few huge moose walking through a lake towards us. A beautiful sight and we were the first ones to stop. After a few minutes and by the time the animals were right beside us about 50 cars had stopped next to the road and more than hundred people took selfies with these animals as if they were some tamed pets. 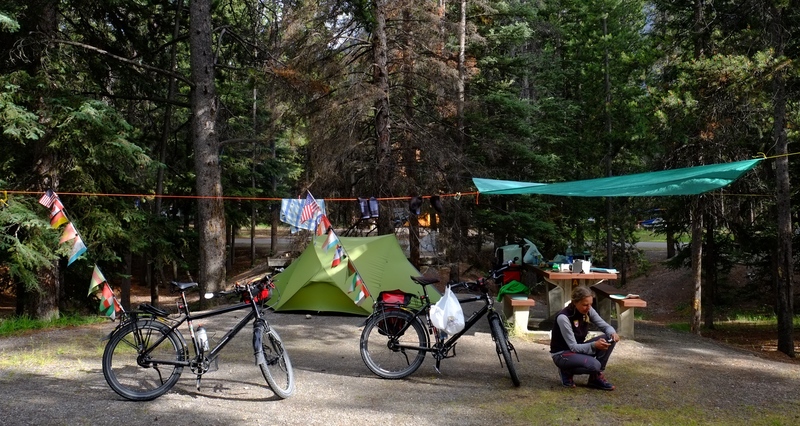 In Jasper we were lucky that the campsite always reserved a few spots for cyclists and hikers as we didn’t want to wild camp. There we met Greg, a Canadian teacher at a First Nation School, with whom we would spend more time over the coming days. We also met Willi, Anne and Arthur – a wonderful German family who invited us twice for dinner just because they admired what we were doing. 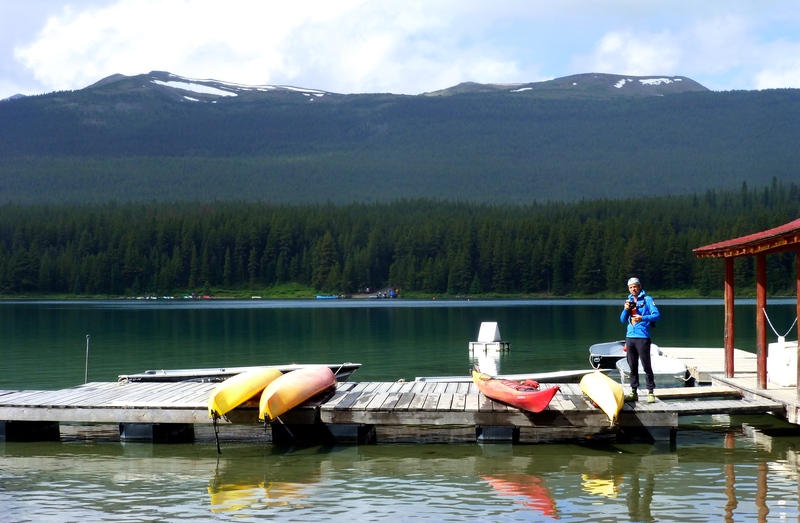 They also took us in their car to beautiful Maligne lake where we hiked for a few hours. From now on there was exactly one road through the National Park. 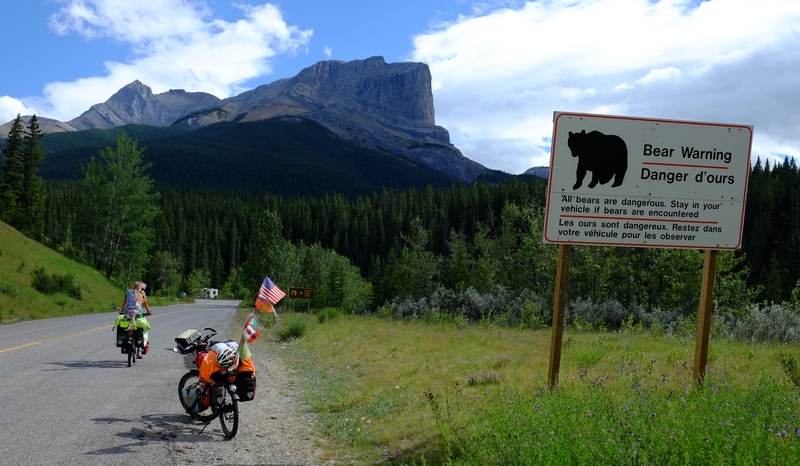 Traffic lessened a bit the further we went into the park and cycling was extremely rewarding: the landscapes would change constantly, we saw quite some wildlife including bears and usually managed to arrive at one of the beautiful wilderness campsites on time. 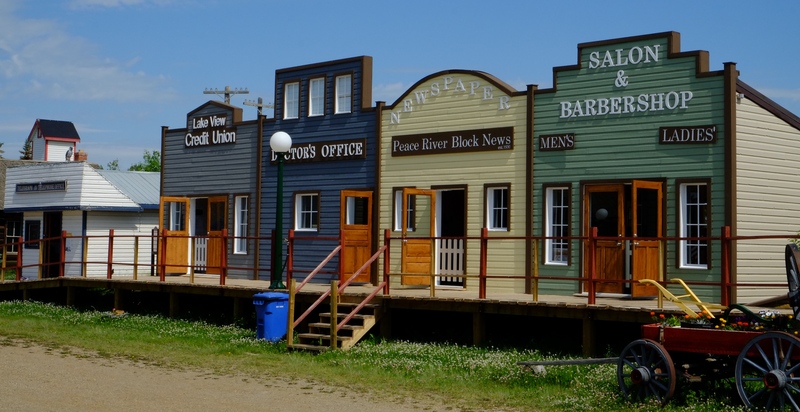 These campsites are very basic, all you get is outhouses, firewood and if you are very lucky drinking water. There are usually tables and benches at every pitch which saved us from cooking and eating on the ground. Often you hardly see any other campers as the campgrounds are big and spread out in a forest. At Lake Louise we met Greg again. 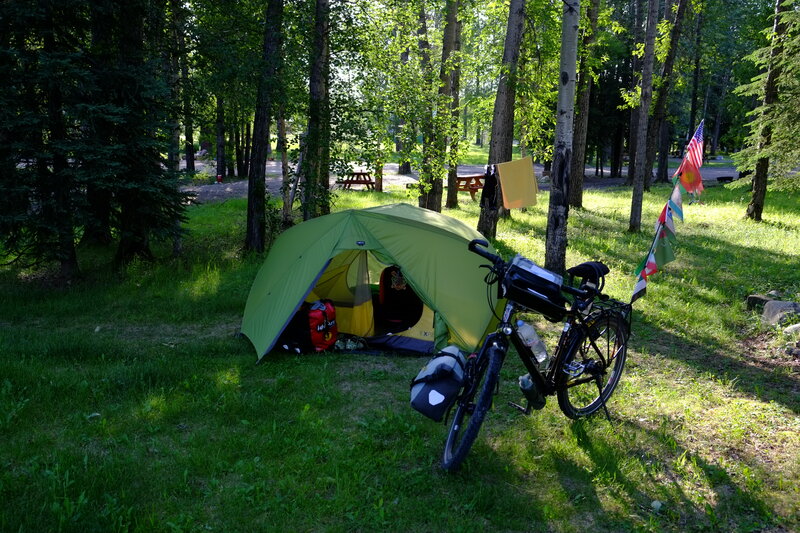 We had arrived in the late afternoon and were lucky enough to get the last camp spot at a local campground (we desperately needed showers after a few days cycling without any facilities). Too tired to cook ourselves we treated ourselves to a dinner out where Greg already pleasurably munched on his huge hamburger. He had just arrived and wanted to stay at the hostel – but that was full so he was forced to camp out once more. As we knew that the only campground was full we offered him to pitch his tent next to ours. And so we stayed together for a few more days at Lake Louise where he hiked and we cycled to Lake Moraine and Lake Louise. 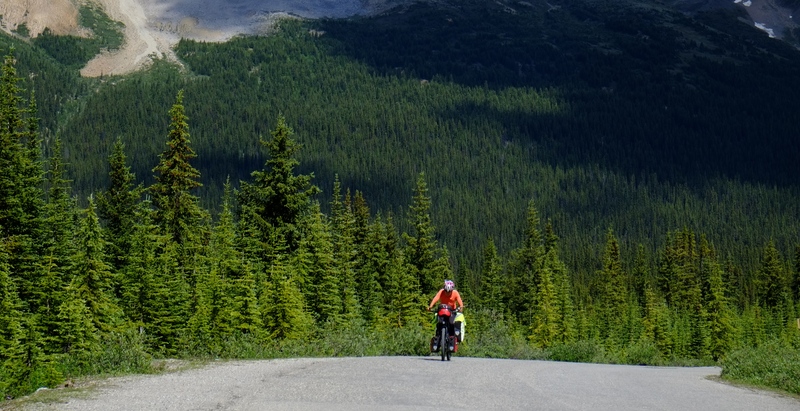 Due to too many cars the police had closed the 15km-long road to Lake Moraine and we happily cycled up the mountain and to a beautiful and relatively quiet site. 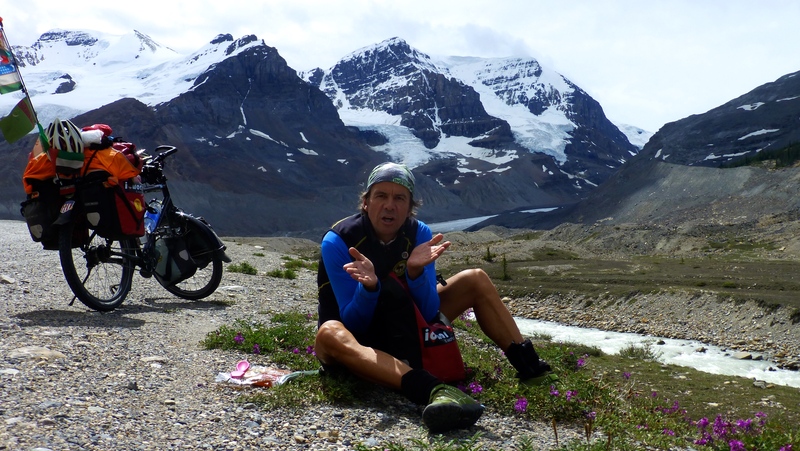 Since I’ve met Johan he had told me he wanted to go skiing with me in Canada and show me Lake Louise. This seemed for him a very nice and romantic place many years ago. He had been there with his grandmother at the age of 12 – more than 40 years ago. However, things have changed in the meantime and thousands of tourists made this once for him so special place a disappointing one and we cycled back quickly after we had managed to take a few photos. 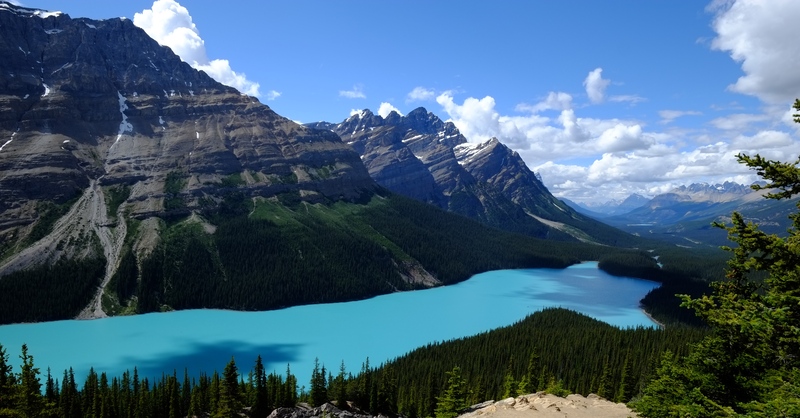 By the time we arrived in Banff we had passed a few more summits, saw absolutely beautiful crystal-clear lakes from high above and had even enjoyed a few sunny summer days. The day we arrived in Banff it would just pour again, for days in a row. 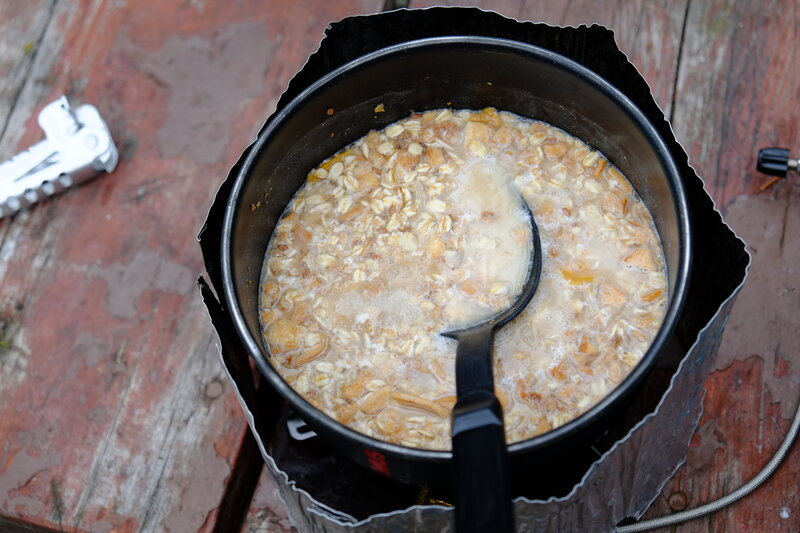 Thankfully the campground managers gave us a tarp so we were able to cook. 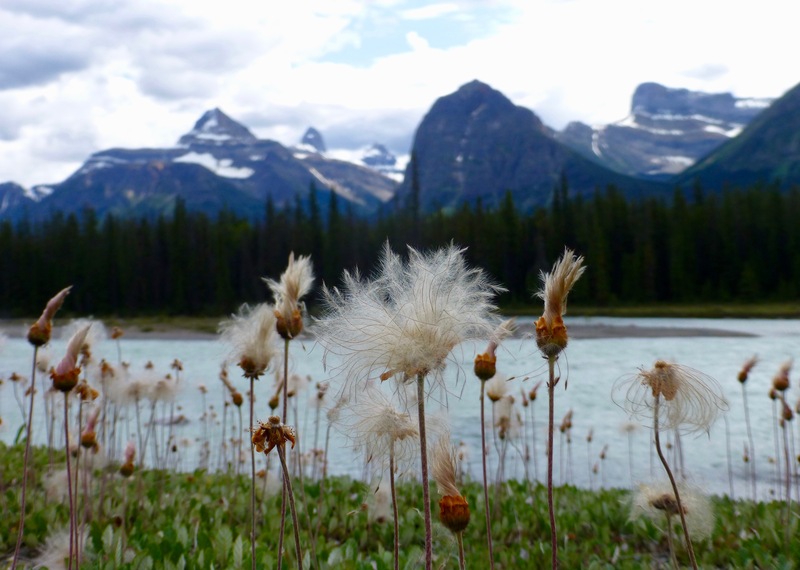 But we did not go on hikes or did any other tours and after two days we moved on quickly towards Calgary. 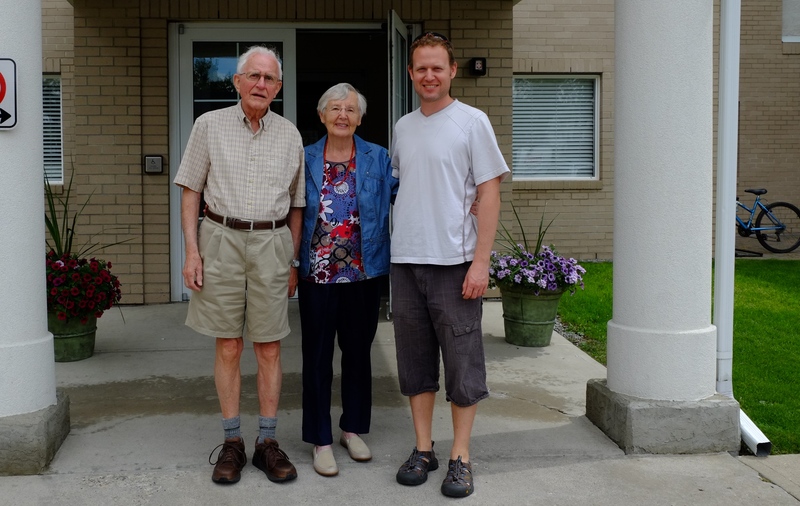 Johan’s uncle Reinier emigrated to Canada in the early ’50s and this was our chance to visit his family abroad. Reinier is married with three sons and as we had about a week left we could meet most of Johan’s family. 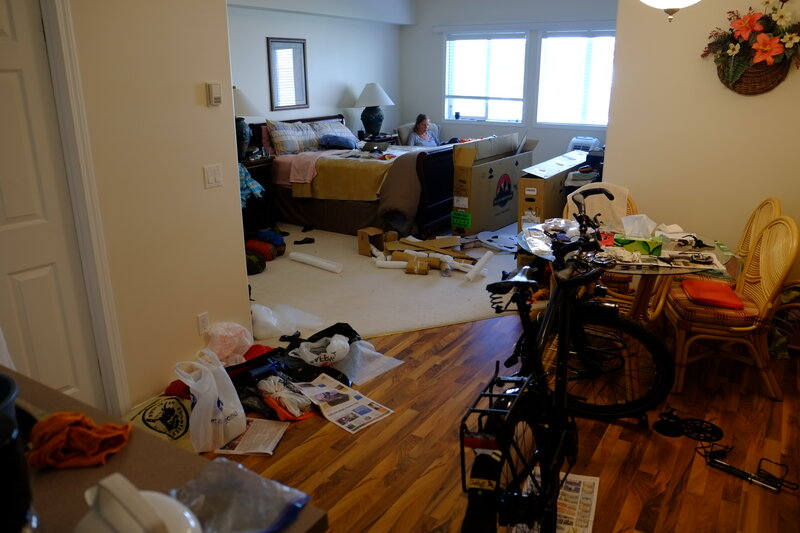 From Anchorage we had sent a huge package with our spare parts, some new clothes and presents from people we met on the road to get rid of some of the heavy stuff we didn’t need. While enjoying dinner with Reinier and his wife Ann we were looking forward to our treasures only to hear, that they had given everything to the “Bibles with a Mission” thrift shop. When the package had arrived a few months ago they didn’t remember anymore what to do with it and where it came from, so they thought they better bring it to the bible shop where they used to work once per week. Shocked with disbelieve we needed a few days to get over it. In the end all got settled in a good way and we left without any hard feelings. 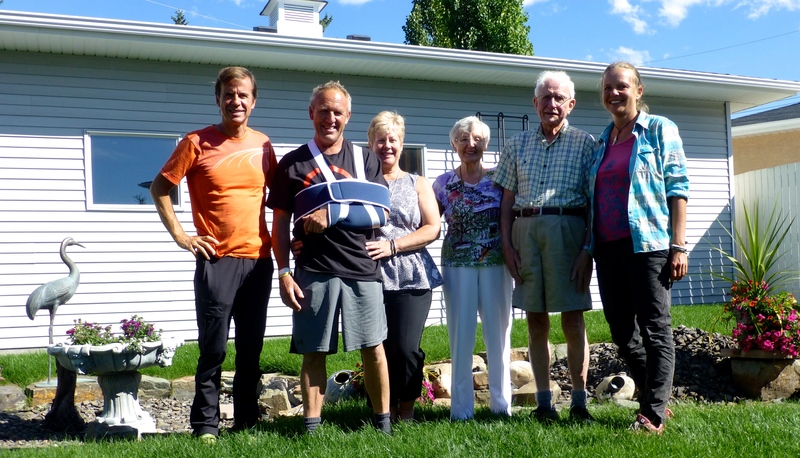 We had been treated very well in Calgary – Johan even got his favourite Dutch dish cooked – and were sad to leave them behind, not knowing if and when we would see them again. 30. Juni – 22. Juli 2016 – Zwischenzeitlich hatten wir unsere Flüge zurück nach Europa gebucht. Irgendwie fühlte sich diese Reise nicht mehr richtig an, wir freuten uns über nichts und niemanden mehr und waren auch körperlich ziemlich ausgelaugt. Bis vor kurzem hatten wir noch mit so vielen Dingen immer Glück: wir trafen auf die richtigen Menschen, das Wetter war fast immer so, wie wir es uns vorgestellt hatten und wir fuhren durch aufregende und abwechslungsreiche Landschaften. Die letzten Monate waren anders. Wir genossen eigentlich gar nichts mehr: nicht unsere Freiheit und noch viel weniger unserer Umgebung. Wir waren richtiggehend reisemüde und hatten so gar keine Lust mehr, unser Zelt jeden Tag woanders aufzustellen. Dazuhin noch bei Wind und Regen. Die wenigen Menschen, die wir unterwegs trafen waren auch nicht so, wie wir erhofft hatten. Das alles machte uns ziemlich depressiv. Normalerweise können wir uns gegenseitig motivieren, da es meistens einem von uns besser ging, doch auch das war jetzt nicht mehr der Fall. Und da wir an keinem Wettrennen teilnahmen noch uns irgendetwas beweisen mussten buchten wir also Flüge zurück nach Europa. Aber noch durften wir ein Paar Wochen Radeln, denn das machte uns noch immer Spaß: draußen sein und in die Pedale treten. 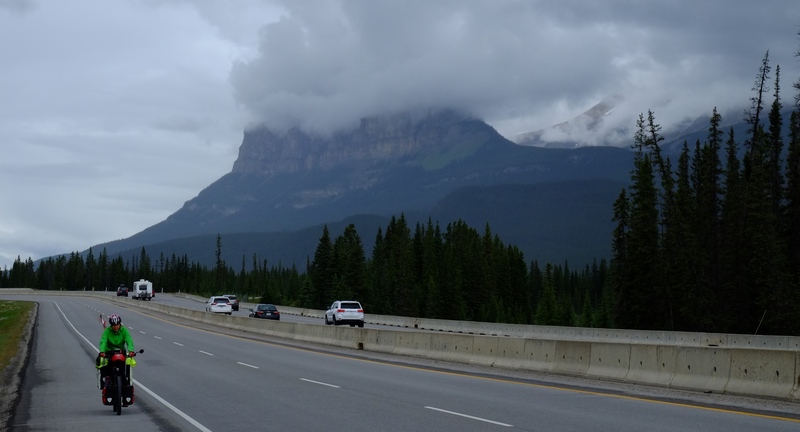 Wir befanden uns mittlerweile auf dem Weg zum Jasper und Banff Nationalpark in den Rocky Mountains. 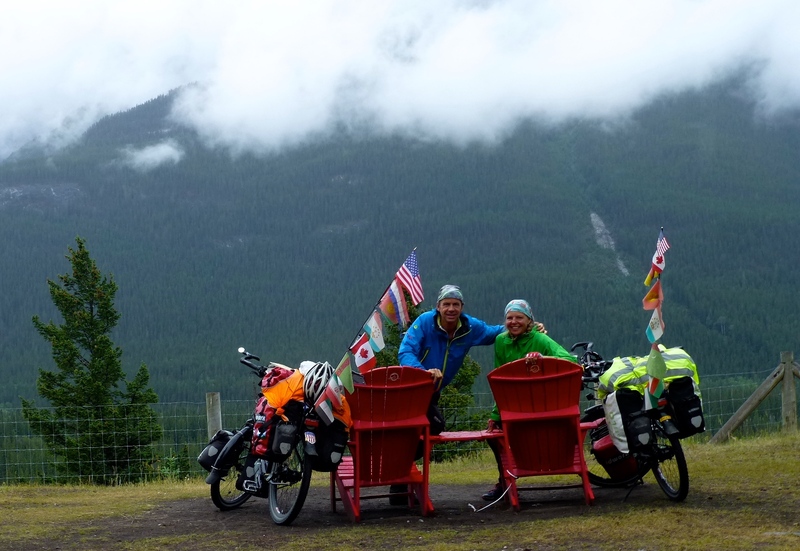 Wir waren uns allerdings nicht bewusst, dass wir genau am Kanada-Tag-Wochenende unterwegs waren – ein langes Wochenende, an dem alle Kanadier anscheinend in den Park wollten und wir so gemeinsam mit tausenden motorisierten Touristen in den Park einrollten. Wir hatten einmalige Aussichten bei extremem Verkehr. Uns war auch nicht wirklich klar, wie teuer es eigentlich war, um Zeit im Park zu verbringen und ärgerten uns ein bisschen darüber, dass wir genauso viel bezahlen mussten, wie alle Autofahrer auch. Denn hier wird nach Kopf und nicht nach Fahrzeug bezahlt. Noch nerviger war, dass alle Campingplätze voll waren und noch nicht einmal für unser kleines Zelt ein Platz frei war. Mit unserer Warm Shower Gastgeberin Sue und ihrer Tochter in Hinton – letzte Stadt vor dem Nationalpark. Während wir uns überlegten, was wir tun sollten, kam ein Ranger auf uns zu und bot uns an, neben ihrer Hütte auf dem nahegelegenen Campingplatz zu übernachten. Wir akzeptierten sofort. Am Campingplatz warnten sie uns allerdings vor einem Schwarzbären, der derzeit hier sein Unwesen trieb. Trotzdem stellten wir unser Zelt neben dem Häuschen der Ranger auf und waren froh dort zu sein, da wir sowohl Bad als auch Küche mitbenutzen durften während es draußen wieder einmal in Strömen regnete. Trotz zahlreicher Warnungen verlassen viele ihre Autos, nur um tolle Selfies zu schießen. Es regnete die ganze Nacht durch, aber unser Zelt blieb trocken. Gegen 10 Uhr setzte sich die Sonne endlich durch und wir konnten im Trockenen weiterradeln. Unsere nächste Destination war Jasper, wo wir ein Paar Tage bleiben wollten, um von dort Tagestouren in die Umgebung zu machen. Die Landschaft um uns herum war fantastisch und wir versuchten, die vielen Autos auszublenden und uns nicht aufzuregen. Plötzlich sahen wir in der Ferne einige Elche, die in unsere Richtung durch einen See hindurch stapften. Auch das war wunderschön anzusehen und wir waren auch die ersten, die die Elche bemerkt hatten. Innerhalb kürzester Zeit hielten allerdings mindestens 50 Autos am Straßenrand und sicher über 100 Menschen machten Selfies mit den Elchen, als wären sie irgendwelche zahmen Haustiere. 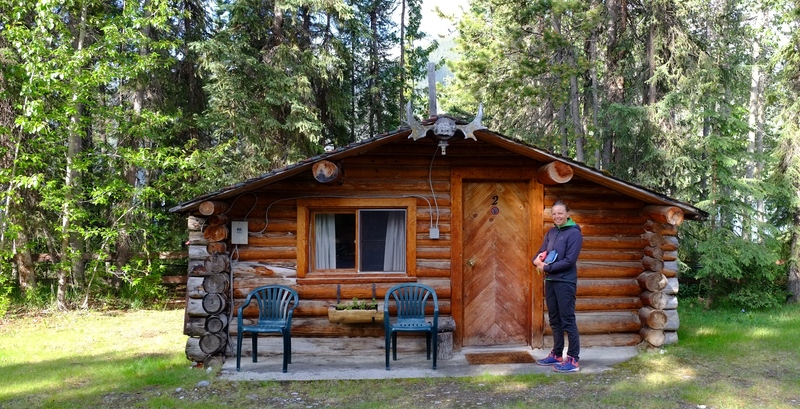 In Jasper hatten wir Glück, dass der Campingplatz immer einige Plätze für Radler und Wanderer freihielt und wir mussten nicht wild zelten. 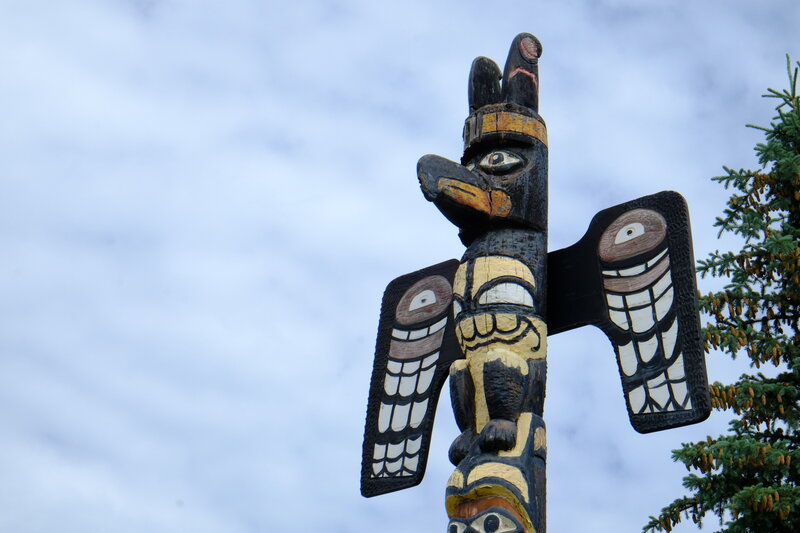 Dort trafen wir Greg, einen kanadischen Lehrer an einer First Nation Schule, den wir die nächsten Tage noch öfters treffen sollten. Wir haben auch Willi, Anne und Arthur getroffen – eine supernette deutsche Familie, die uns zweimal zum Abendessen eingeladen hatte, weil sie von unserer Reise so beeindruckt waren. Wir fuhren mit ihnen auch zum wunderschönen Lake Maligne, wo wir ein bisschen wanderten. Ab jetzt gab es für uns nur noch eine Straße durch den Nationalpark. Der Verkehr war deutlich geringer je weiter wir in den Park hineinfuhren und das Radeln hat hier wieder sehr viel Spaß gemacht: die Landschaft änderte sich ständig, wir sahen einige wilde Tiere einschließlich Bären und schafften es immer rechtzeitig zu einem der Wildnis-Campingplätze. 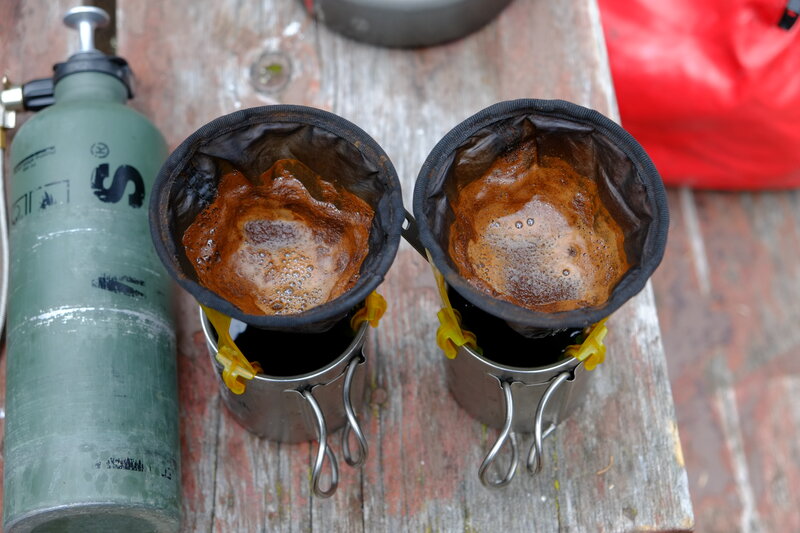 Diese Campingplätze sind sehr einfach, meist gibt es nur ein Plumpsklo, Feuerholz und wenn wir Glück hatten Trinkwasser. Auf jedem Stellplatz standen Bänke und ein Tisch und so mussten wir nicht auf dem Boden kochen und essen. Wir haben nur sehr selten andere Camper gesehen, da sich die Plätze meist auf einer großen Fläche im Wald verteilten. In Lake Louise trafen wir wieder auf Greg. Wir kamen am späten Nachmittag an und ergatterten uns den letzten freien Campingplatz (es war an der Zeit für uns, mal wieder zu duschen). Da wir zu müde waren, um selbst zu kochen, gönnten wir uns ein Abendessen im Restaurant. Dort saß dann schon Greg, der genüsslich seinen Hamburger verschlang. Er war eben erst angekommen und wollte eigentlich im Hostel übernachten, das war aber schon voll. Nun musste er also auch wieder zelten. Da wir wussten, dass er auch auf dem Campingplatz keine Chance hatte, boten wir ihm an, sein Zelt bei uns aufzuschlagen. 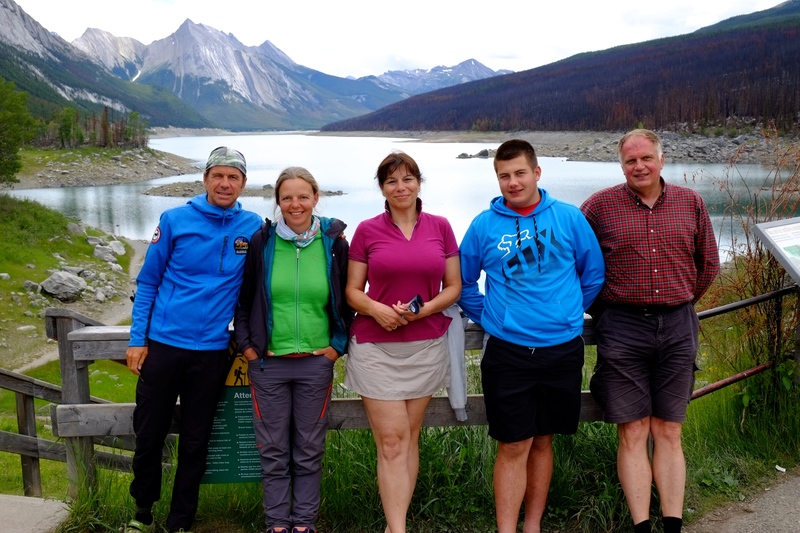 Und so verbrachten wir ein Paar gemeinsame Tage in Lake Louise, Greg wandernd und wir radelnd: Nach Lake Moraine und zum See Louise. 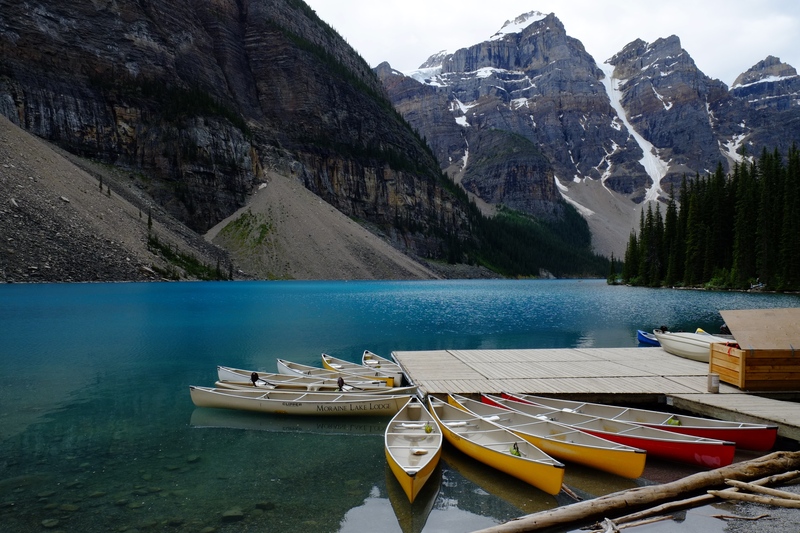 Da die Parkplätze bei den Seen bereits überfüllt waren, schloss die Polizei kurzerhand die Straße zum Lake Moraine und wir konnten fast alleine die 15km zum See hochradeln. Seit ich mit Johan zusammen bin wollte er mit mir nach Kanada zum Skifahren reisen und mir Lake Louise zeigen. Er hatte hieran schöne und romantische Erinnerungen. Allerdings war er dort im Alter von 12 Jahren mit seiner Großmutter und das ist immerhin schon mehr als 40 Jahre her. In der Zwischenzeit hat sich dann doch einiges verändert und von Romantik ist mit Tausenden von Touristen nicht mehr viel übrig gebliebenen. Daher waren wir beide ziemlich enttäuscht und fuhren nach ein Paar Fotos schnell wieder zurück. 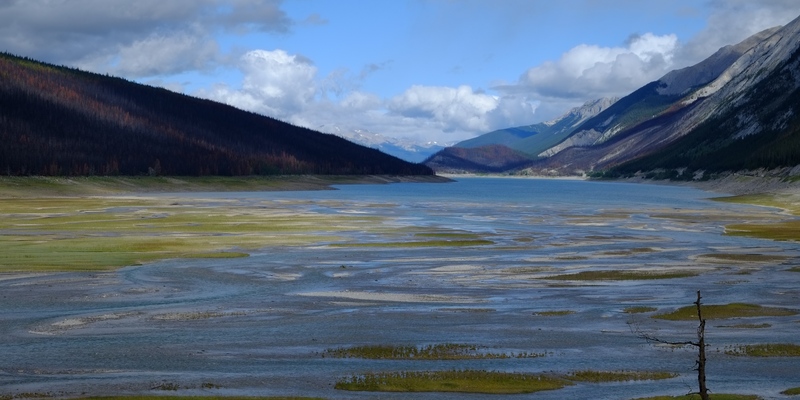 Bis nach Banff galt es noch einige Gipfel zu überwinden. Wir sahen absolut atemberaubende kristallkare Seen von weit oben und konnten sogar ein Paar schöne Sommertage genießen. 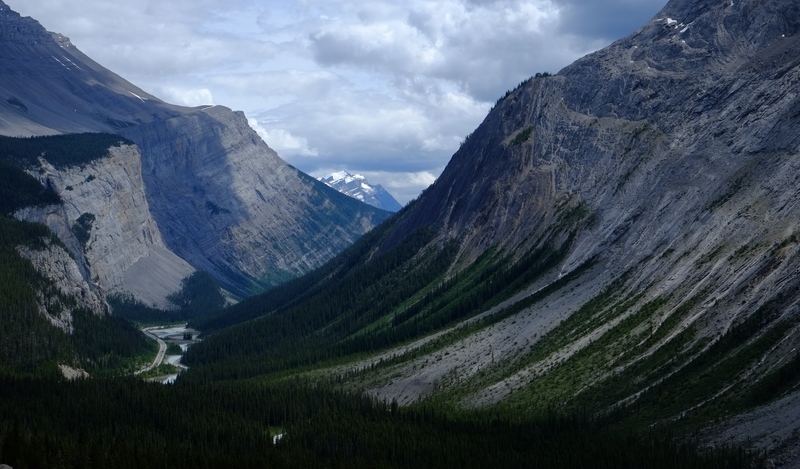 Als wir dann in Banff ankamen, schüttete es wieder aus allen Kübeln und das tagelang. Auf dem Campingplatz bekamen wir zum Glück eine Plane, die wir über unseren Platz spannten, damit wir im Trockenen kochen konnten. 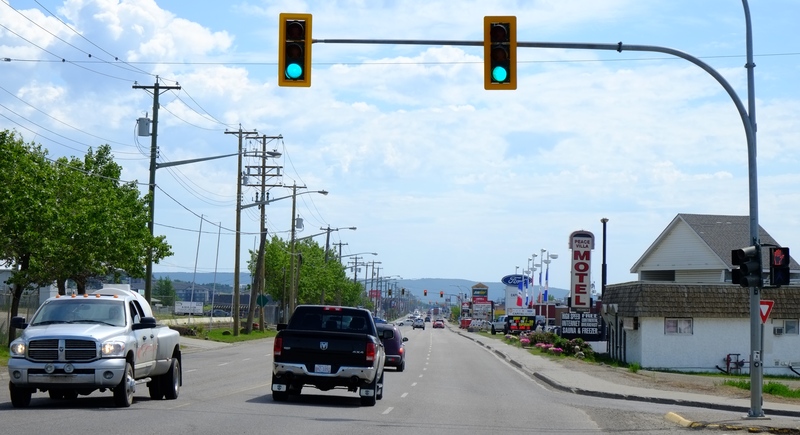 Leider konnten wir aufgrund des zu schlechten Wetters nicht wandern oder Ausflüge machen und so fuhren wir nach zwei Tagen weiter in Richtung Calgary. Johans Onkel Reinier emmigrierte in den frühen 50er-Jahren nach Kanada und jetzt hatten wir die Gelegenheit, ihn und seine Familie zu besuchen. 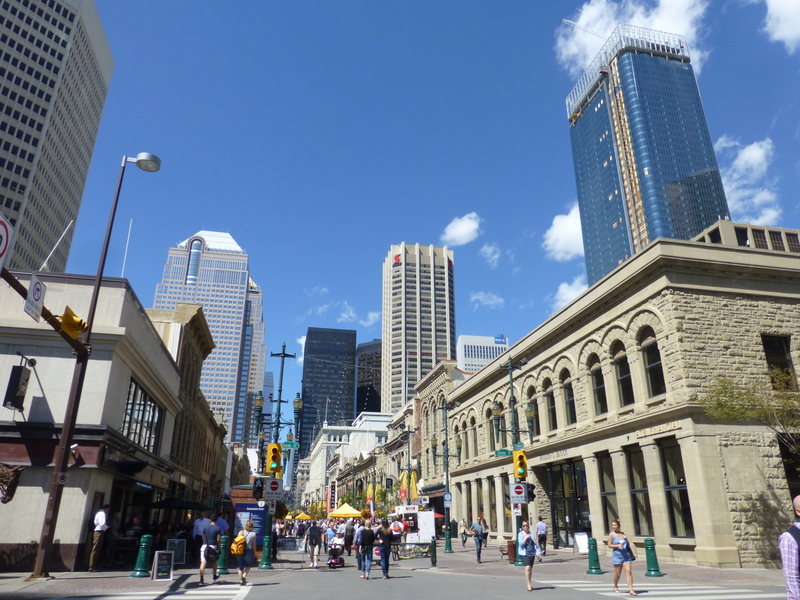 Reinier ist verheiratet und hat drei Söhne und da wir über eine Woche in Calgary verbrachten, konnten wir auch fast alle besuchen. 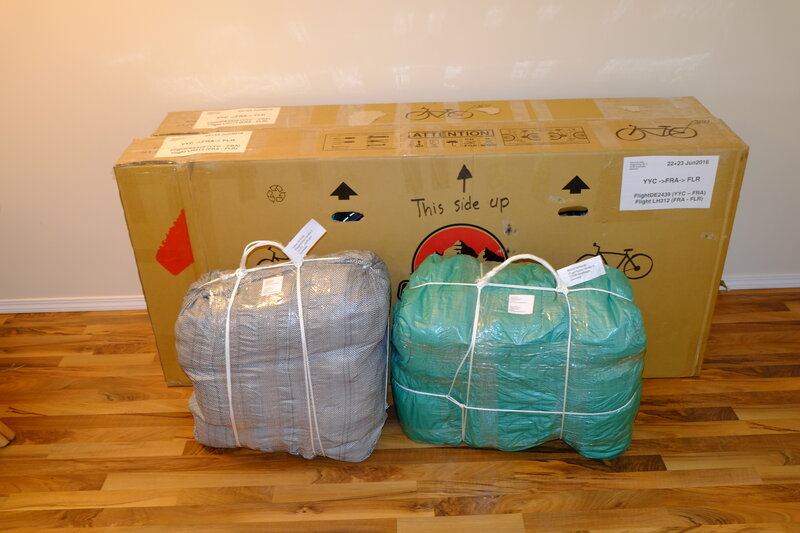 Aus Anchorage hatten wir ein riesiges Paket vorausgeschickt mit Ersatzteilen, neuen Klamotten und Geschenken von Menschen, die wir unterwegs getroffen hatten, um ein bisschen an Gewicht loszuwerden. Beim ersten Abendessen mit Reiner und seiner Frau Ann freuten wir uns schon auf unser Paket. Wir mussten uns allerdings sagen lassen, dass all unsere Sachen in einem Bibelladen verkauft worden sind. Als das Paket vor ein Paar Monaten ankam wussten Johans Verwandte nicht mehr, was sie damit machen sollten und woher es kam und dachten, das sei im Second-Hand-Shop wohl am besten aufgehoben. Es dauerte einige Tage, bis wir über diesen Schock hinwegkamen. Am Ende haben wir dann alles geregelt und können heute darüber schmunzeln. Wir hatten trotz allem eine sehr schöne Zeit in Calgary, wurden lecker bekocht – sogar mit Johans holländischer Lieblingsspeise – und am Ende waren wir traurig, wieder abreisen zu müssen. Denn wir wissen ja nicht, wann und ob wir sie überhaupt noch einmal wiedersehen. …zu vier nett eingepackten Paketen. Letztes Foto bevor der Flug geht. 13. -29. Juni 2016 – In Watson Lake pausierten wir für ein Paar Tage, um unsere Batterien wieder aufzuladen, Wäsche zu waschen und E-Mails zu checken. Endlich konnten wir auch wieder den Luxus eines richtigen Supermarktes genießen und Obst und Gemüse kaufen. WLan gab’s bei der Touristinformation umsonst. 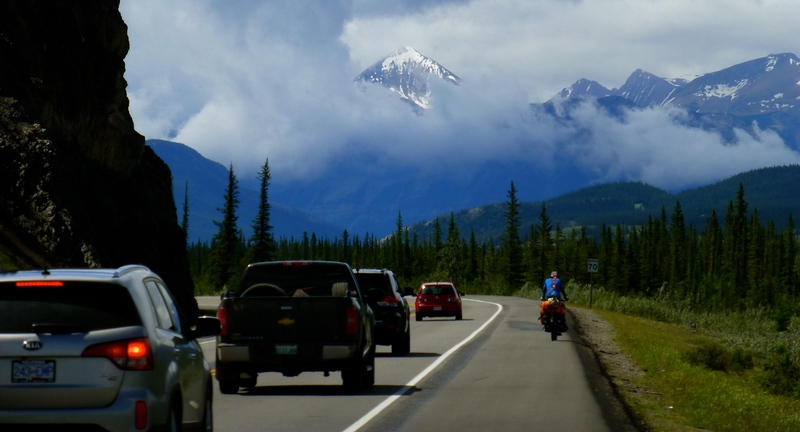 Außerdem erhielten wir einen Zettel mit detaillierten Streckeninformationen und wussten genau, wo wir auf dem letzten Stück des Alaska Highways etwas zu essen kaufen konnten. Auf dem Campingplatz trafen wir Vanda, die ihren Ruhestand in einem riesigen Campingbus verbrachte und durch Nordamerika reiste. Bei ihre durften wir abends unsere Essenstaschen lagern, da es auf dem Campingplatz keine Schließfächer dafür gab. Um uns herum gab es viel zu viele Bären und wir wollten kein Risiko eingehen. Als wir von Watson Lake aufbrachen wussten wir, dass wir die nächsten 200km durch pure Wildnis fuhren und so nahmen wir Essen für drei Tage mit. Das schlechte Wetter ging leider weiter und wir wurden jeden Tag patschnass. Auch das stetige Auf und Ab wollten kein Ende nehmen. Leider versperrte uns das schlechte Wetter die Sicht auf schneebedeckte Bergketten. Mittlerweile hatten wir den nördlichsten Teil der Rocky Mountains bereits überquert und den ganzen Tag sahen wir nichts als öde Tannen wohin auch immer wir blickten. Die erste Nacht verbrachten wir hinter einer heruntergekommenen Tankstelle, wo wir uns spärlich in der dreckigen Mini-Toilette waschen konnten. In der zweiten Nacht schafften wir es zu einem ganz netten Campingplatz und wir waren froh, dass wir duschen konnten, so durchgenässt und durchgefroren wie wie waren. Im Restaurant aßen wir wohl den kleinsten und damit auch teuersten Hamburger mit einer 5-$-Salatbeilage, die für uns dauerhungrige Radler eher wie Dekoration aussahen. Mit knurrenden Mägen gingen wir schlafen und machten am nächsten Morgen unser eigenes Frühstück, um nicht auch noch hungrig weiterradeln zu müssen. … und der ein oder andere Bär durfte natürlich auch nicht fehlen. …das kein Ende nehmen will. Jetzt freuten wir uns auf die Liard Hot Springs, da wir wussten, dass wir hier wieder etwas zu essen kaufen konnten und in den 45-Grad heißen Quellen baden wollten. Das Wetter war nach wie vor miserabel, aber die Landschaft wurde deutlich spektakulärer mit einem reißenden Fluß unter uns und dramatischen Wolkenformationen. 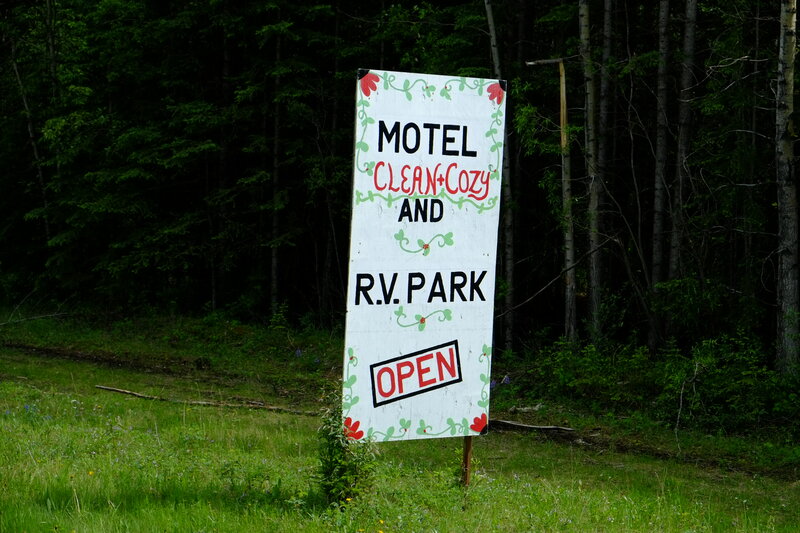 Klatschnass und völlig durchgefroren erreichten wir die Liard Hot Springs nur um feststellen zu müssen, dass der Laden so rein garnichts zu Essen verkaufte außer Marmelade für 9$ und Chips. Das Restaurant war zu allem Überfluss geschlossen. Wir waren völlig schockiert, da wir uns auf die Touristinformation verlassen hatten und daher fast nichts mehr zu essen übrig war. Die nächste Möglichkeit aufzustocken war erst nach 100 schweren Kilometern. Die Verkäuferin erzählte uns andauern, wir könnten doch einfach 50km zurückfahren, dort gäbe es einen kleinen Laden. Sie schien irgendwie nicht zu kapieren, dass wir mit den Rädern nicht einfach Mal so hungrig zurückfahren können. Eine weitere Frau hörte unser Gespräch und bot uns an, uns auszuhelfen. Sie fuhr auf den gegenübergelegenen Campingplatz und kam kurz darauf mit zwei Flaschen Bier, Dosentomaten, Bohnen, Kartoffelpüree, Brot und Würstchen wieder. Ein weiterer Mann bot uns ebenfalls Essen an und so bekamen wir noch gefriergetrocknetes Armeeessen und Energieriegel. Wir waren völlig überwältigt von der Großzügigkeit dieser Menschen, die wir gerade erst getroffen hatten. Und es kam noch besser: Es regnete noch immer stark und wir radelten durch den Campingplatz bei den heißen Quellen nur um festzustellen, dass mittlerweile alle Plätze vergeben waren. Ein kanadisches Ehepaar sah uns und bot uns ein Plätzchen auf seinem Stellplatz an. Und so verbrachten wir einen wunderschönen Nachmittag und Abend mit Kanadiern – unser Glaube an das Gute im Menschen wurde definitiv an diesem Tag wieder hergestellt. Am Muncho Lake gönnten wir uns bei einem Resort eine kleine Hütte und ein exzellentes Abendmenü im Hotel, das von einem Schweizer Ehepaar geführt wird, da wir die Kälte und den Regen satt hatten. Am folgenden Tag trafen wir Keith aus Schottland auf seinem Liegerad, der in 10 Monaten von Alaska nach Südamerika radeln möchte. Wir ließen uns von seinem Enthusiasmus und seiner positiven Natur gerne anstecken, unsere Moral war derzeit nicht die Beste. 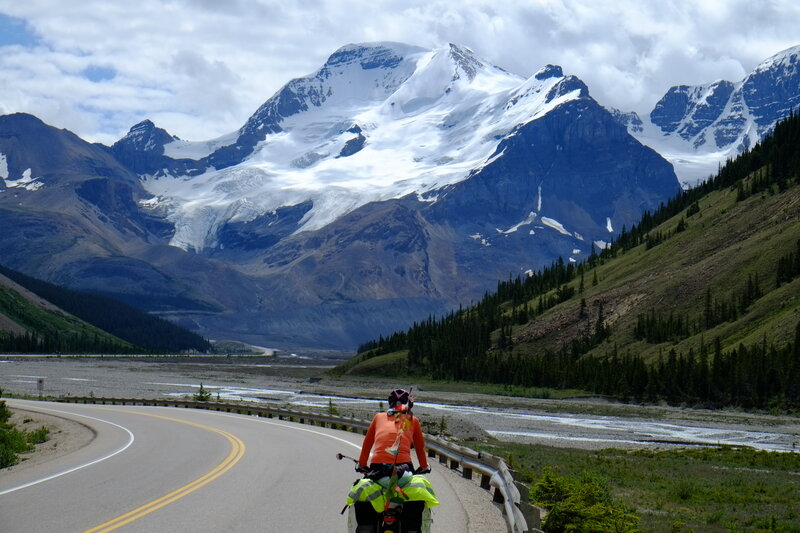 Wir trafen ihn noch einige Male unterwegs bevor er sich in Richtung der kanadischen Prärie machte und wir wieder in die Rocky Mountains abzweigten. … und was noch von einem verlassenen Campingplatz am Muncho Lake übrig ist. Mit Sicherheit eine tolle Art und Weise, um die Rockies von oben aus einem Wasserflugzeug zu bestaunen – wenn man das nötige Kleingeld dafür hat. Neugierige Bergschafe, obwohl ich finde, dass sie eher wie Ziegen aussehen. In Fort Nelson blieben wir wieder ein Paar Tage auf dem Campingplatz, da es wieder Mal aus allen Kübeln schüttete. Dort erhielten wir fast Platzverweis, da wir es wagten, das kostenlose WLan zu nutzen. Da es so stark regnete und es auf dem Campingplatz außer einem Restaurant keine Möglichkeit gab, Schutz vor dem Regen zu suchen geschweige denn zu kochen, saßen wir den ganzen Tag im Restaurant und aßen auch jeder drei Mahlzeiten. Und natürlich lasen wir auch unsere E-Mails oder checkten Nachrichten (für Blog-Updates war das WLan viel zu langsam). Zweimal wurden wir an diesem Tag darauf hingewiesen, das Internet nicht zu nutzen und am nächsten Tag wurden wir nochmals darauf angesprochen. Ich ärgerte mich so, dass ich mich beschwerte, immerhin gaben wir hier genug Geld aus. Als Antwort bekamen wir nur, dass wir gerne auch abreisen könnten, wenn es uns nicht passte! Auf demselben Campingplatz bekamen wir an einem Nachmittag Besuch von einem Amerikaner. Johan war nicht besonders gut gelaunt und antwortete entsprechend kurz angebunden auf die vielen Fragen. Er erzählte auch, dass wir so enttäuscht über die Unfreundlichkeit der Menschen hier im Land waren, verglichen mit den Menschen in Asien oder im Nahen Osten. Etwas später erzählte uns der Mann, dass seine Frau ihn geschickt hatte, um die “Teenager” zu fragen, ob sie nicht in ihrem Campingbus schlafen wollten, wenn es später immer noch so stark regnete. Wir mussten dann doch sehr lachen und plötzlich zog der Mann seine Geldbörse aus der Hose, drückte Johan 40 Dollar in die Hand und sagte, das sei für unser Abendessen. Er dankte uns für die Unterhaltung und lief davon. Konsterniert schauten wir uns an, freuten uns dann aber doch über ein Abendessen im Restaurant. Am Abend dann saß die Familie am Tisch neben uns, ohne uns zu beachten. Wir fanden das dann doch eine etwas seltsame Situation – wir hätten eher erwartet, dass wir gemeinsam essen oder dass sie für uns kochen würden, waren aber dennoch sehr dankbar für diese freundliche Geste. Nach drei Tagen konnten wir endlich weiterziehen, der Stark- und Dauerregen war endlich vorbei. Wir genossen unseren ersten regenfreien Tag seit Wochen. Gegen Ende des Tages – wir fuhren gerade unseren letzten Hügel hoch – hielt neben Johan ein Auto. Zwei Frauen luden uns zu einer Party im nahegelegenen Dorf ein. Da wir sowieso bereits nach einem geeigneten Schlafplatz Ausschau hielten überlegten wir nicht lange und fuhren hinterher. Zehn Minuten später schaufelten wir Hamburger und Salat in unsere hungrige Mägen. 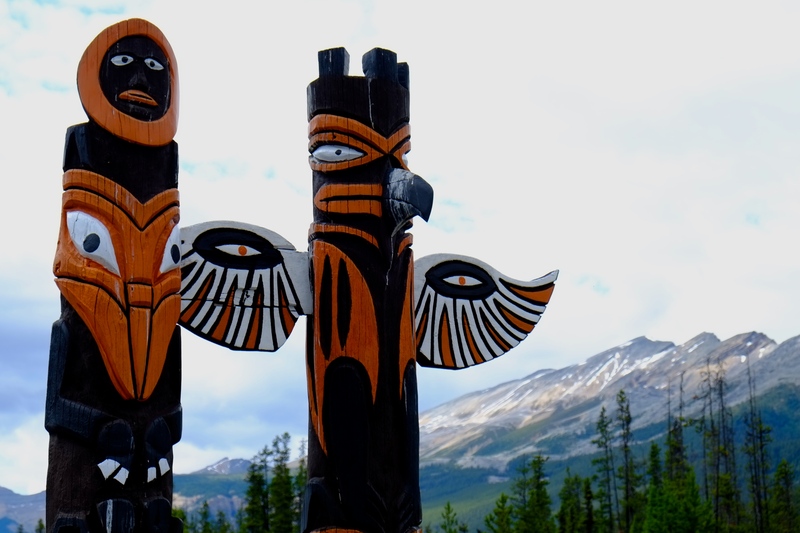 Wir waren in einem sogenannten First Nations Dorf (First Nations werden in Kanada die Ureinwohner genannt) und sie feierten gerade mit viel Essen und alkoholfreien Getränken (noch immer haben viele Eingeborenen Alkoholprobleme), Tanz und Musik ihren Vertragsabschluss mit den Weißen, der ihnen vor zig Jahren mehr Rechte gab. Bei einem dieser Eingeborenen durften wir sogar übernachten. Alle waren hier sehr freundlich und sie wollten uns auch gar nicht mehr gehen lassen. Trotzdem zogen wir am nächsten Morgen nach einem ausgedehnten Frühstück und mit einem dicken Lunchpaket von dannen. In diesem Container im Hintergrund durften wir bei den Eingeborenen übernachten. 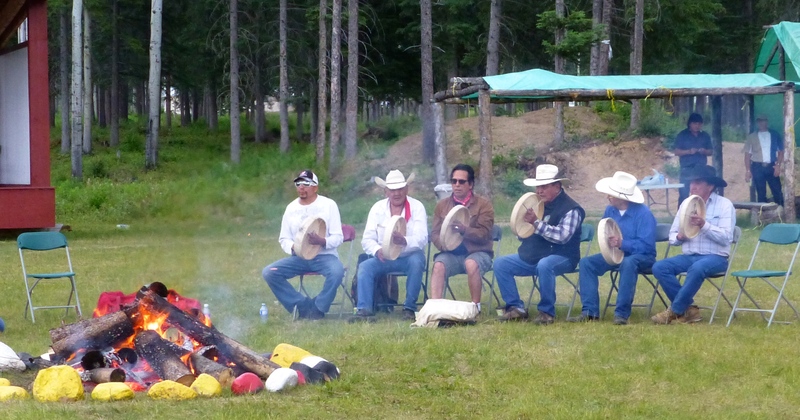 Traditionelle Musik mit den First Nations. Alles wird hier gegessen – der Rest des Elches befand sich im Räucherhaus oder auf dem Grill. Ab hier wurde die Landschaft noch langweiliger, mit unendlichen Hügeln und Wäldern und der Verkehr nahm auf einmal auch dramatisch zu. Vor allem Holztrucks rasten mit hoher Geschwindigkeit an uns vorbei. Das Radeln machte überhaupt keinen Spaß mehr und zu allem Überfluss bekam ich auch wieder Probleme mit dem Knie. In Oneowon stellten wir uns schließlich an den Straßenrand und strecken den Daumen raus. Innerhalb von fünf Minuten hielt ein Pickup-Truck und wir ersparten uns zwei langweilige und wahrscheinlich auch gefährliche Radeltage. Tom arbeitet in der Öl-und Gasindustrie und war auf dem Weg in die Stadt, um seine Frau zum Abendessen zu treffen. 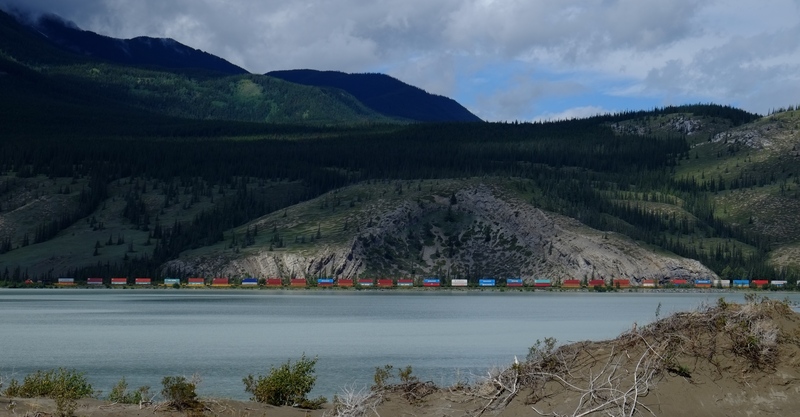 Dort angekommen, luden sie uns zu einer Pizza ein und seine Frau fuhr mit uns weiter nach Dawson Creek – Meile 0 des Alaska Highways. Wir hatten zwar ein richtig schlechtes Gewissen, dass wir die letzten 140 km nicht selbst geradelt sind, waren aber aufgrund des sehr starken Verkehr doch froh über unsere Entscheidung. Und es kam noch besser. 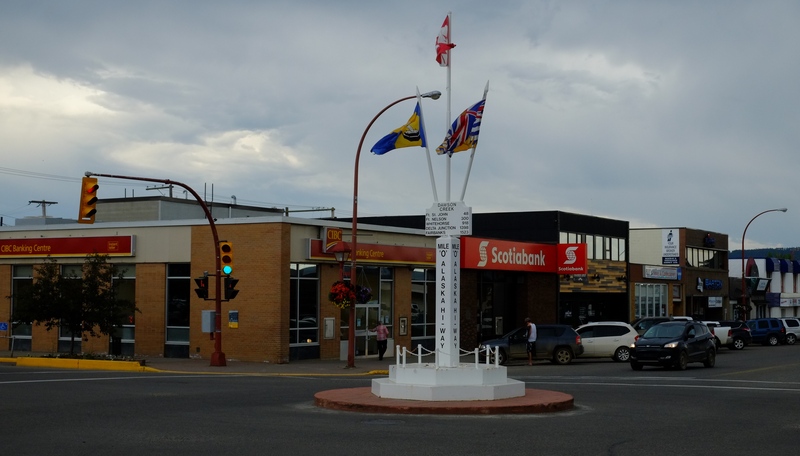 Tom und Shirley leben in Edson, Alberta und so durften wir nach ein Paar Tagen weitere 500 km mitfahren und vermieden einen eher langweiligen und stark befahrenen Teil Kanadas. 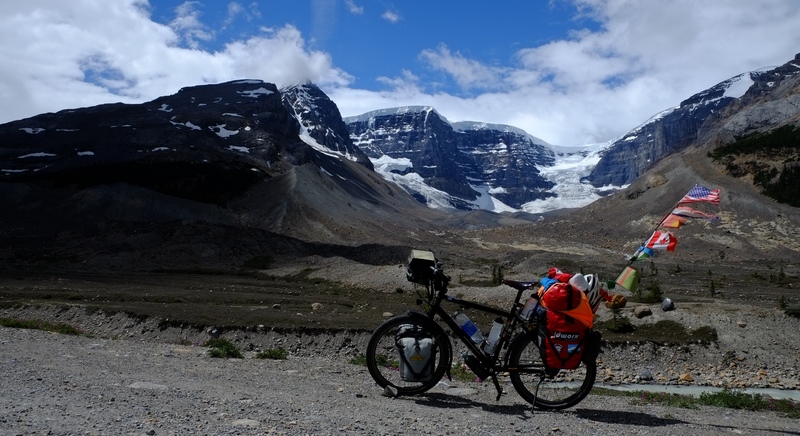 Sie brachten uns auf einen Campingplatz und am nächsten Tag konnten wir weiter aus eigener Kraft in Richtung Rocky Mountains und Jasper radeln. … aber zum Glück gab es auf diesem Campingplatz ein kleines Schutzhäuschen. 13 -29 June, 2016 – At Watson Lake we rested for a few days to recharge our batteries, do our laundry and catch up on email. We also enjoyed the luxury of a real supermarket where we could buy fruits and vegetables again. 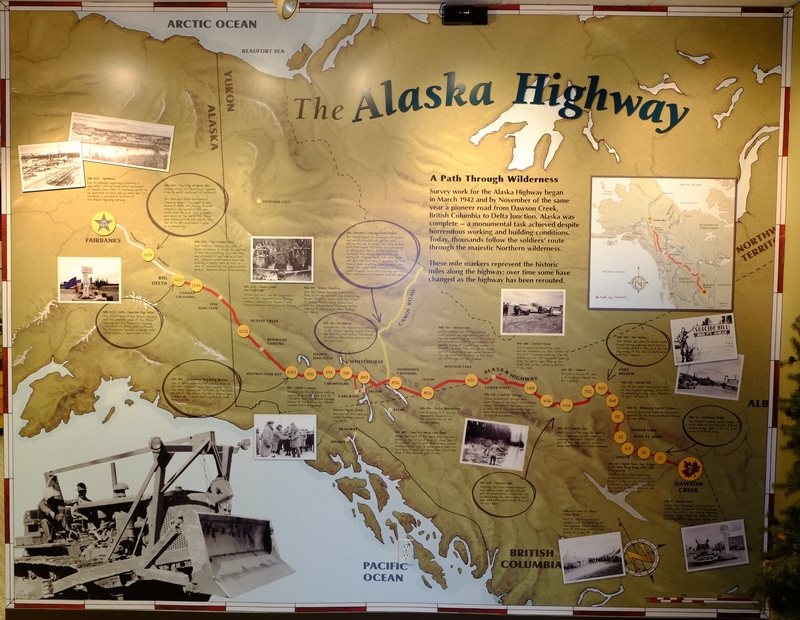 There was free WiFi at the tourist information center and they even had detailed information about places where we could stock up on food on the final stretch of the Alaska Highway. 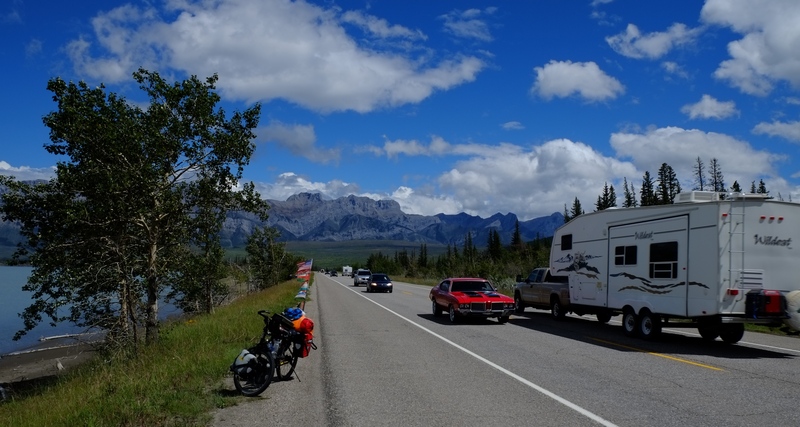 We met Vanda, a retired Canadian travelling alone in her RV through Canada and the US. She was so kind to store our food bags at night as the campground didn’t provide any food lockers to protect us from the bears. When we left we knew there was a shop and a restaurant after about 200km so we carried food for three days. The bad weather continued and we got wet every day. 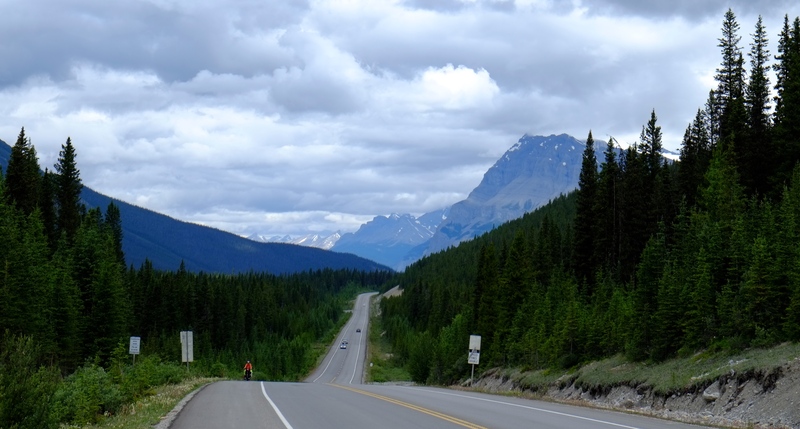 The rolling hills continued as well but the scenic snow-capped mountains unfortunately disappeared. 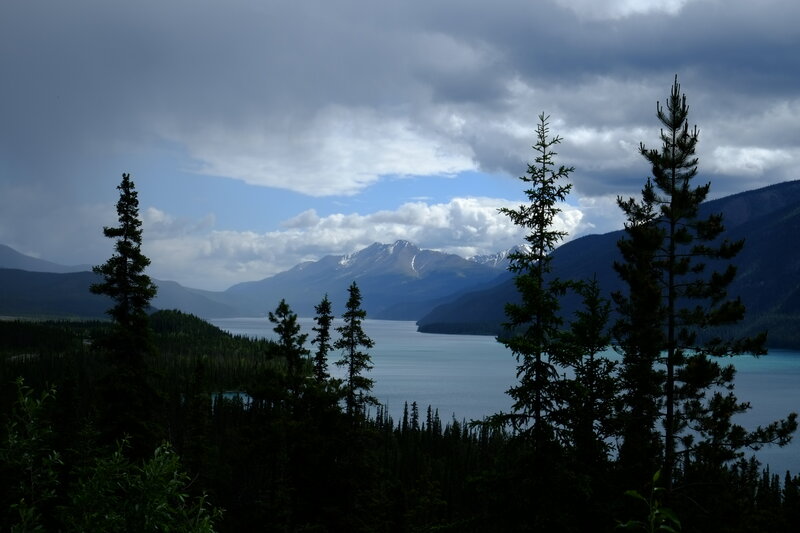 We had crossed the Rocky Mountains and the rain and mostly overcast sky made it impossible to see anything else than trees, trees and more trees. The first night we pitched our tent behind a run-down gas station where we could use the toilet. 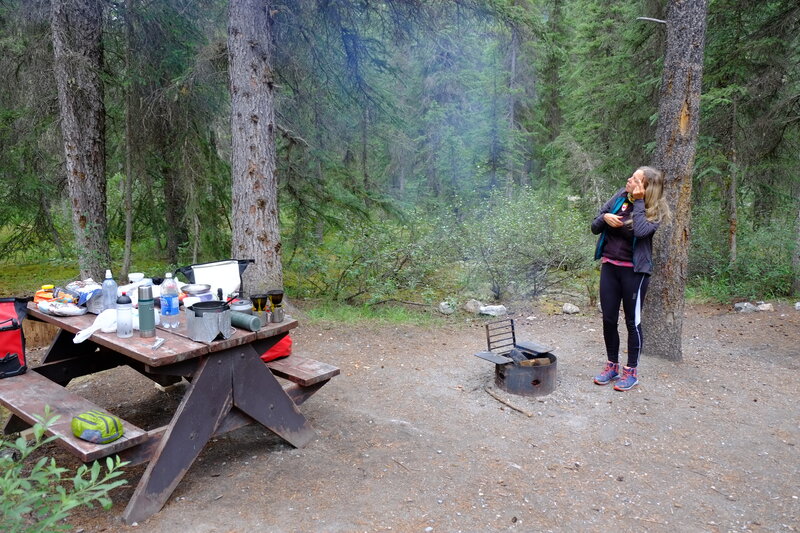 The second night we reached a campground and were happy to take a hot shower before going to bed. For an awful lot of money we got the smallest meal we’ve ever seen, the salad was so tiny that we thought it was just decoration. Going to bed hungry we opted for our own breakfast the next morning to make sure we got enough fuel for the upcoming hilly section. 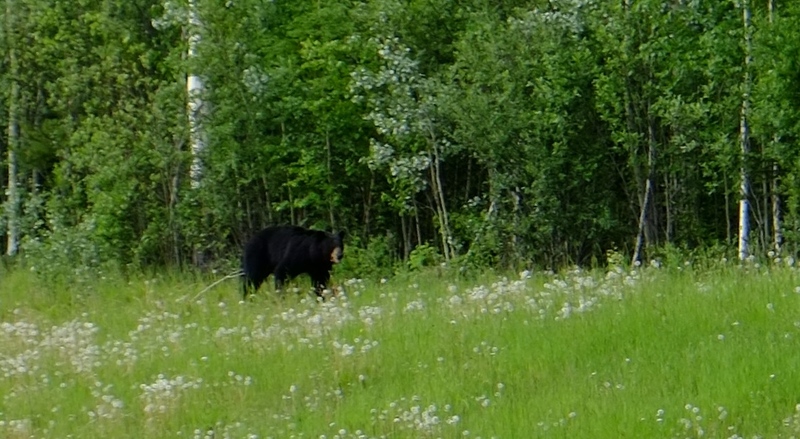 …and of course the odd bear here and there most of the days. I’m cycling in the rain…. …I’m still singing in the rain. 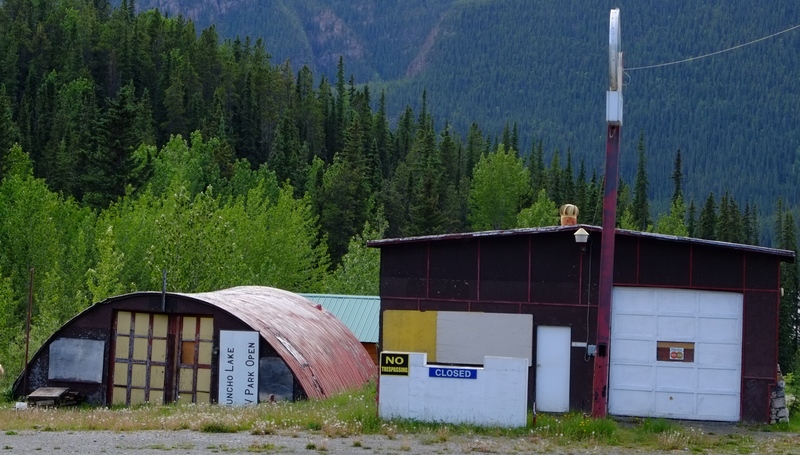 We were now looking forward to the Liard Hot Springs as we knew we could stock up on food. 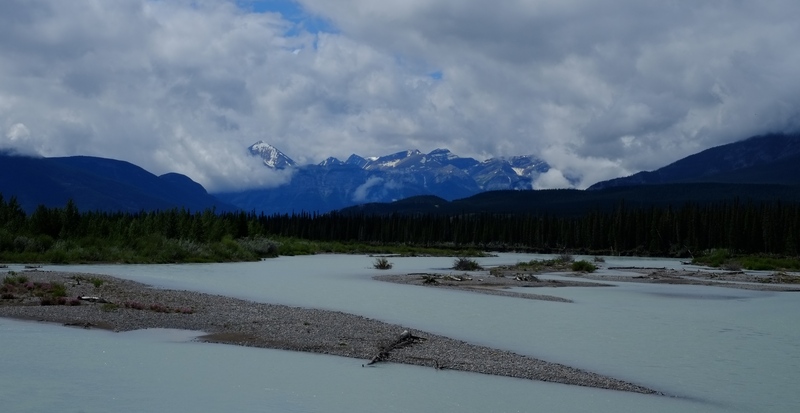 The weather continued to be miserable, but the scenery improved with a quite spectacular river and cloud formations between the trees. Wet to the bones and cold we arrived at the hot springs only to find out that the shop had nothing to sell other than jam for 9$ and chips. And the restaurant was closed. We were shocked as we had no more food left and the next facilities were more than 100km away. 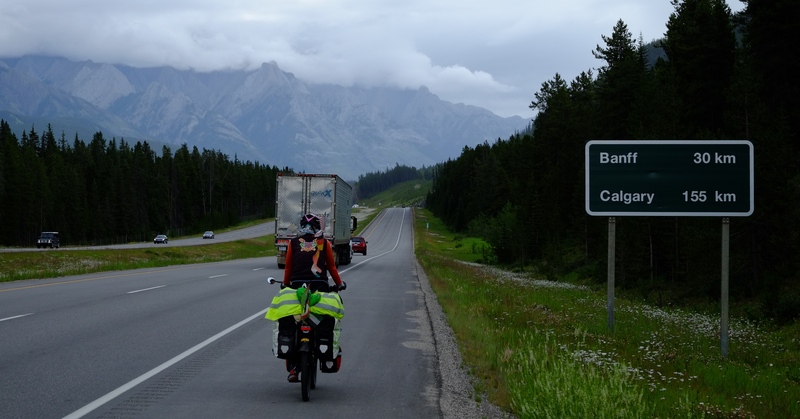 The girl at the shop continued telling us, that we could ‘drive’ back 50km to where we came from, even though we told here various times that we had just come from there and that it wasn’t an option for us on our bikes. A woman had overheard our conversation and told us that she would have a look at her groceries and give us a few things. She came back with 2 beers, cans of tomatoes and beans, mashed potatoes, bread and sausages. Another guy also offered us some food and asked us to his campervan where we got a lot of dry-freezed military meals and energy bars. We were overwhelmed by this generosity. 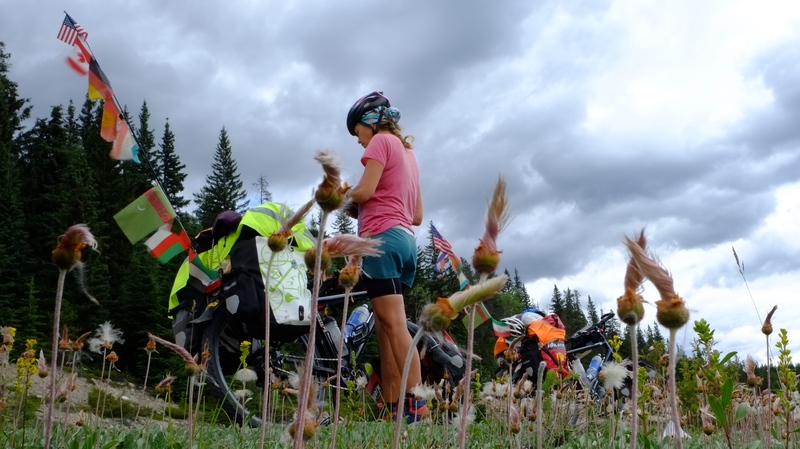 But it would even get better: it was still raining and we cycled through the campground just to notice that all sites were taken in the meantime. 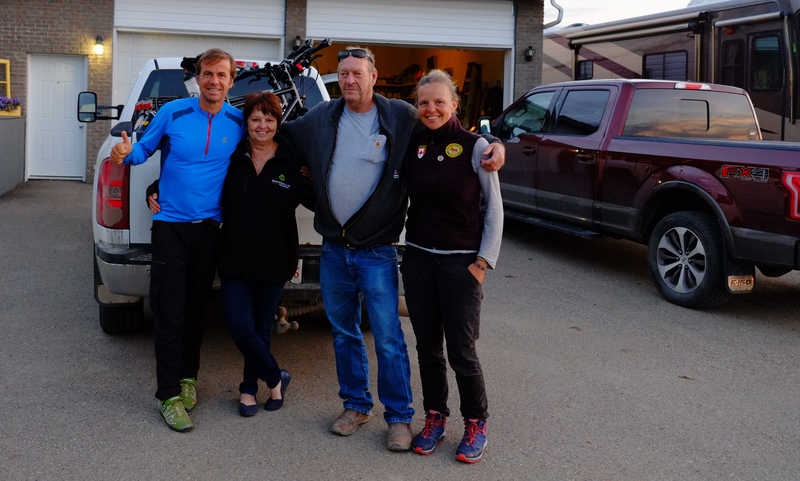 A Canadian couple saw us and invited us to pitch our tent on their site – and we spent a wonderful afternoon and evening with them. Our faith in human kindness definitely got restored that day. At Muncho lake we treated ourselves to a cabin and lovely dinner at the Swiss-run hotel to escape from the cold and rain. 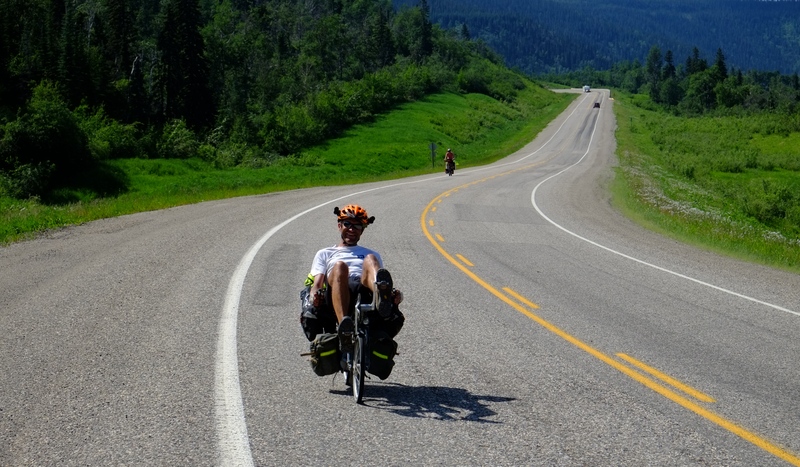 The next day we met Keith from Scotland on his recumbent bike who is cycling from Alaska to South America. We had a nice chat and loved his enthusiasm, something we were at the moment lacking of. 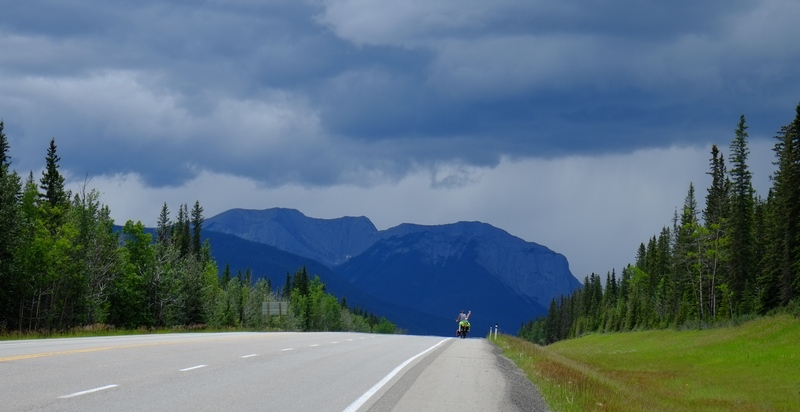 We met him a few more times along the way before he turned off in the direction of the Canadian prairies while we were riding into the Canadian Rockies. 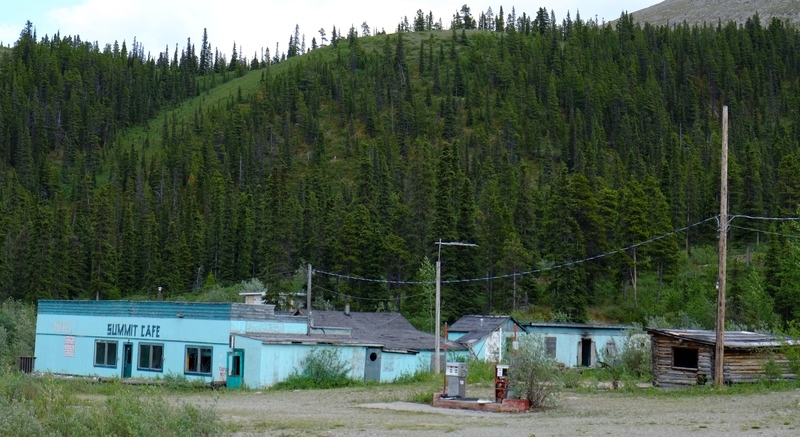 …and what’s left from an abandoned RV Park at Muncho Lake. Certainly a nice way to see the stunning landscapes from high above in a water aircraft if you have some spare Dollars left. 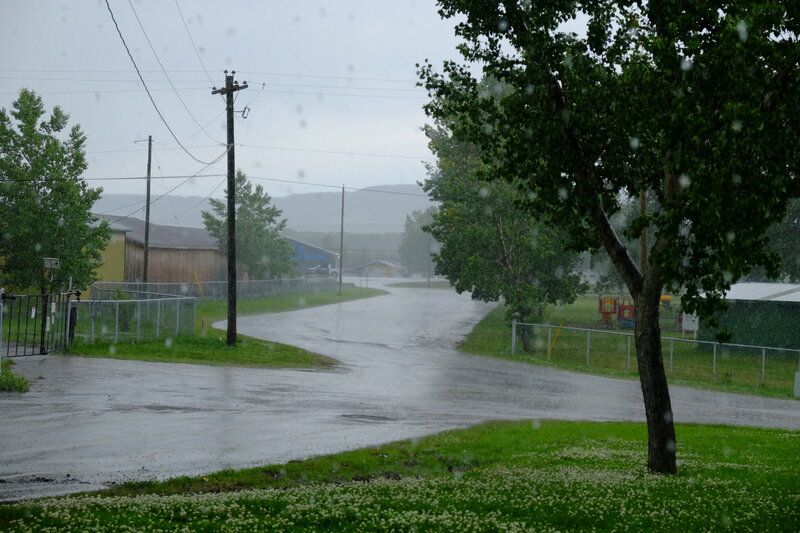 As the weather was really bad we rested a few more days at a campground in Fort Nelson. We were almost kicked out because we dared using their free WiFi. 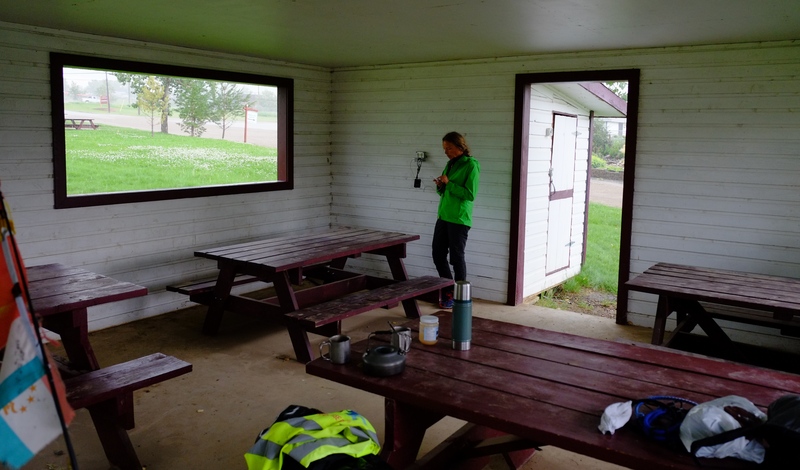 It happened that it rained cats and dogs one day and we sat in their restaurant – eating there three times as there was no shelter anywhere on the campground to be able to cook ourselves – and of course also checking emails etc. Twice that day we were told not to use the Internet all day long (which we didn’t) and the next day we got reminded again. When I became quite upset and remarked that we are spending a lot of money besides the camping we were told we could also leave if we weren’t happy here. 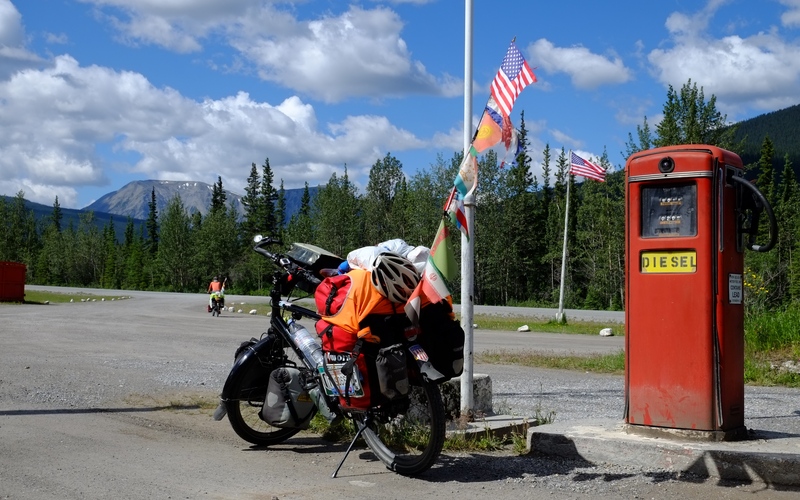 On that same campground an American approached Johan and started asking questions about our ride. At first, Johan was pretty unfriendly, not at all in the mood to talk but only telling the guy how unfriendly people in the West were compared to people in Asia or the Middle East. A bit later the American told us that his wife had sent him to ask the ‘teenagers’ if they would like to sleep in their motorhome in case it would rain again. We had a good laugh and suddenly he told us, that he would like to invite us for dinner. He opened his wallet, gave Johan 40 USD and thanked us for the conversation. Consternated we looked at the money and the guy disappearing slowly. Later that evening we sat at the table next to the American and he wouldn’t say a word to us. That was one of the strangest situation for us: we would have expected to eat together or that they would cook for us, but sitting next to them and pretending we don’t know each other was extremely odd. Nonetheless we of course were very grateful for the gesture. After three days the weather improved slightly and we moved on to finish the last part of the Alkan. Happy to be on our bikes again we enjoyed our first rain-free day in weeks. Towards the end of the day on our final hill and right before we wanted to call it a day a car stopped next to Johan. Two nice ladies invited us to join their party in the nearby village. As we anyway were on the lookout for a campspot we accepted the offer and ten minutes later shuffled free hamburgers and salads into our hungry stomachs. We were at a first nation village and they had their yearly treaty celebrations with lots of free food, free drinks (no alcohol as still a lot of first nation people suffer from alcohol addiction) and traditional music and dances. One of the first nation villagers invited us to sleep at his house. Everyone was so friendly and they all welcomed us into their community and even invited us to stay another day. Nonetheless we moved on after an extensive breakfast the next morning and a nice lunch package in our panniers. Every little piece of the animal will be eaten. Most parts of the body were either still in the smoke house or on the barbecue. The landscape became more and more boring, rolling hills and forests and on top traffic suddenly picked up with a lot of logging and other local trucks passing by at a horrendous speed. Cycling became less and less enjoyable and every day was a struggle. On top my knees started hurting again due to our heavy loads and the constant difficult cycling over the often steep hills. At Oneowon we decided to take a lift to the next town and within five minutes a truck stopped and safed us from two even more boring days of cycling. Tom works in the oil and gas industry and drove back into town to meet his wife for dinner. 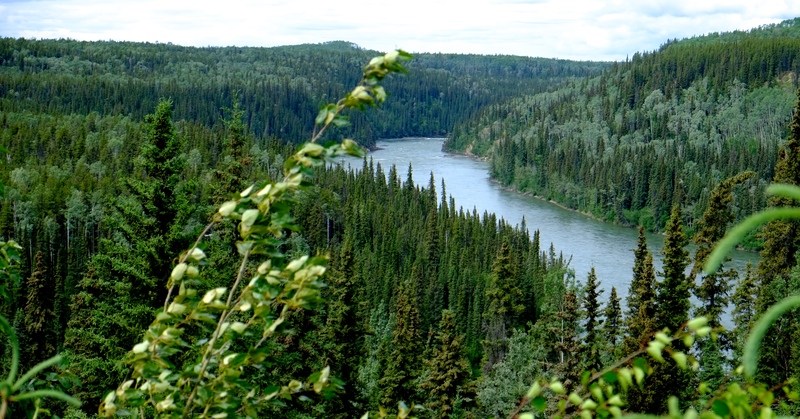 Upon arrival they invited us for dinner and later his wife drove us to Dawson Creek – Mile 0 of the Alaska Highway. 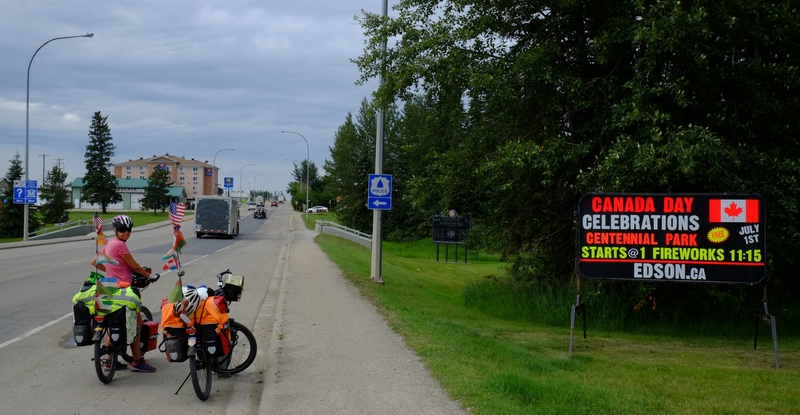 While we had a really bad conscience for not having ridden the last 140km by ourselves we were glad for this offer as cycling would have meant riding on a very busy highway. And it would even get better. 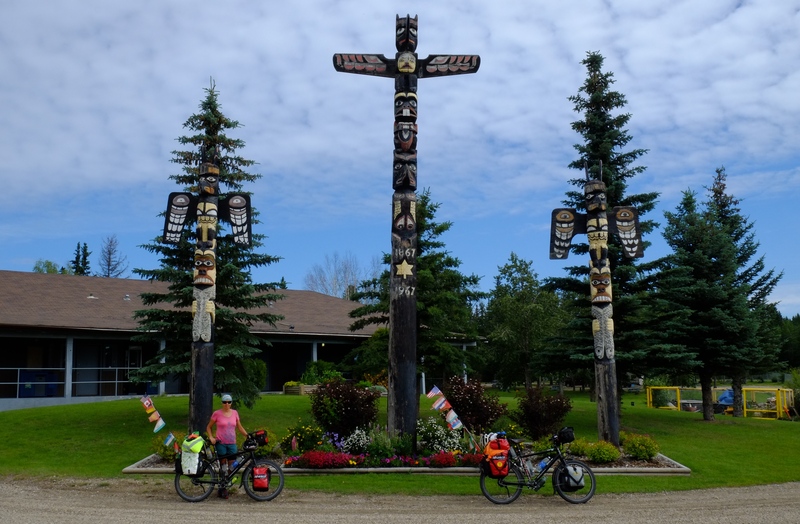 Tom and Shirley’s home is in Edson, Alberta, and we could get another 500-kilometer-ride south to avoid another super boring stretch of roads. 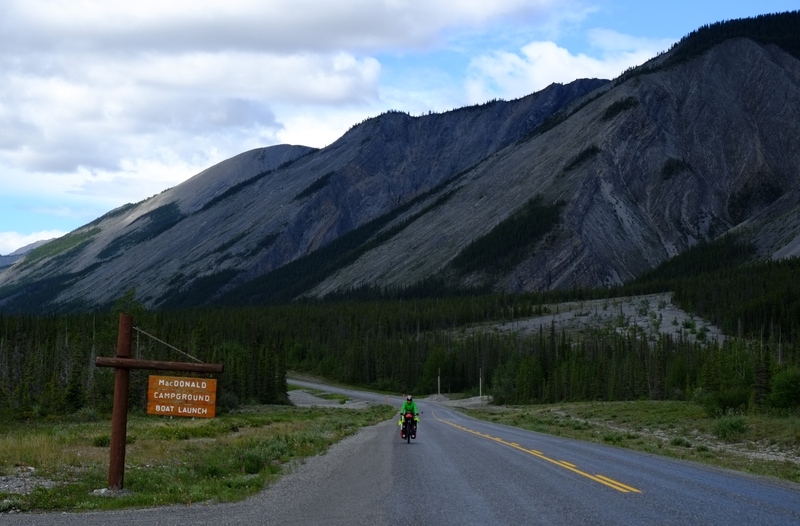 They dropped us at a campground and the next day we could continue cycling into the Rocky Mountains and to Jasper. 27. Mai – 12. Juni 2016 – Nach genau einem Monat auf dem amerikanischen Kontinent erreichten wir die kanadische Grenze. Um ganz genau zu sein standen wir am US-Grenzposten, einem kleinen Gebäude und die Zollbeamten wollten noch nicht einmal unsere Pässe sehen. Wir sollten noch nicht einmal ausgestempelt werden. Auch unsere Visumfragen blieben unbeantwortet, im gewohnt unfreundlichen Ton der US-Beamten. Wir fuhren etwas unzufrieden weiter, da wir noch immer nicht wussten, für wie lange wir später wieder in die USA zurück durften. Hier wurde uns erzählt, dass unsere Zeit in Kanada von unseren insgesamt erlaubten sechs Monaten abgezogen würde. Außerdem wurde uns mitgeteilt, dass wir die USA nur einmal pro Jahr für sechs Monate besuchen dürften. Das war jetzt das dritte Mal, dass wir uns eine andere Geschichte anhören mussten – und das immer von offiziellen Immigrations-Behörden. Nach 25km erreichten wir dann die kanadische Grenze. Ein besonders freundlicher Zollbeamte stellte uns die üblichen Fragen: Wie viel Geld haben Sie? Was arbeiten Sie? Haben Sie vor, ein Verbrechen zu begehen? Haben Sie irgendwelche Waffen bei sich? Wir bekamen unsere Stempel und reisten in unser 32. Land per Rad ein. Noch immer hatten wir keine Bären gesehen, aber wir wussten, dass dies nicht mehr lange dauern würde, da wir uns nun im entlegensten Gebiet unserer Reise befanden. Wir hatten immer Essen für mehrere Tage dabei, da wir kaum gute Informationen darüber bekamen, ob es Läden an den Tankstellen gab oder nicht. Oft mussten wir Hunderte von Kilometern durch die Wildnis radeln, ohne an irgendwelchen Häusern vorbeizukommen. In diesem nördlichen Teil Kanadas war die Landschaft traumhaft. Schneebedeckte Gebirgszüge, Frühlingsblumen am Straßenrand, unendliche Wälder, rauschende Flüsse und bald auch viele Bären und anderes Getier. An einem Tag sahen wir einmal acht Bären. Definitiv zu viele für meinen Geschmack, aber im Nachhinein eine unvergessliche Erfahrung. Die Bären sehen so friedlich und freundlich aus, wenn sie am Straßenrand grasen. 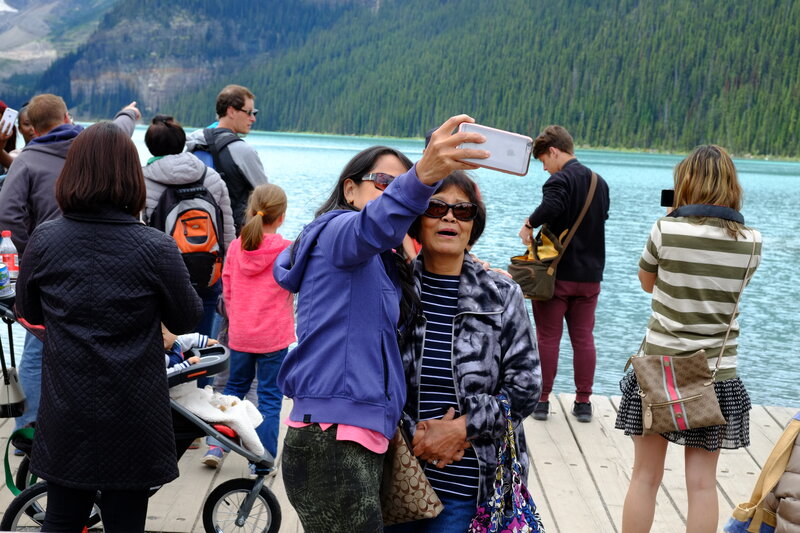 Mehr als einmal regten wir uns über Touristen auf, die meinten, ihre Fahrzeuge verlassen zu müssen, nur um für ein Foto so nah wie möglich an die Bären ranzukommen. Diese Tiere sind gefährlich und wir wurden täglich daran erinnert, wenn wir an ihnen vorbeiradeln mussten. Die Bären fixierten uns, bis wir außer Sichtweite waren. Manche Touristen beschuldigten uns sogar, dass wir die Bären verscheuchen würden. Und tatsächlich rannten einige zurück in den Wald, wenn wir um die Ecke kamen. Meist hielten sie dann in sicherer Distanz an und stellten sich auf die Hinterfüße, um besser sehen zu können. Über diese Touristen konnten wir nur die Köpfe schütteln. Leider hatten wir dieses Mal nicht wirklich Glück mit dem Wetter. Es regnete fast jeden Tag, manchmal nur ein Paar Schauer, oft aber auch Dauerregen. Zusätzlich kämpften wir täglich mit starkem Gegenwind, was uns unsere Zeit hier in Kanada nicht wirklich versüßte. Und als ob das nicht schon genug wäre kamen auch noch sehr unangenehme Kanadier dazu. Der Service entlang des Highways war unglaublich schlecht und die wenigen Läden, Tankstellenbesitzer und Campingplätze scherten sich auch kaum darum. Uns ist schon klar, dass es hier wirklich schwer ist, Geschäfte zu machen, da die Saison kurz ist und die meisten Amerikaner, die hier zu finden sind, verlassen ihre riesigen Campingbusse nur zum Tanken. Und wenn ich hier riesig schreibe, dann meine ich eigentlich gigantisch groß, in der Regel mindestens so groß wie ein großer Reisebus für Fernreisen, die dann auch noch mindestens ein Auto, wenn nicht sogar einen Anhänger, in dem dann ein Auto, ein Motorrad und manchmal sogar noch Räder untergebracht waren. Wir saßen einmal in der Lounge eines Campingplatzes als so ein Gefährt vorfuhr. Johan meinte nur zu mir, “jetzt wird es voll, da fährt gerade ein Reisebus vor, da sitzen sicherlich 50 Leute drin!” Aber wir immer kam nur ein Ehepaar aus diesem Monster. Was uns allerdings am meisten schockierte war die Tatsache, dass es zum Fahren dieser Busse noch nicht einmal eines besonderen Führerscheins bedarf. Wir konnten überhaupt nicht verstehen, warum wir hier so unfreundlich behandelt wurden. 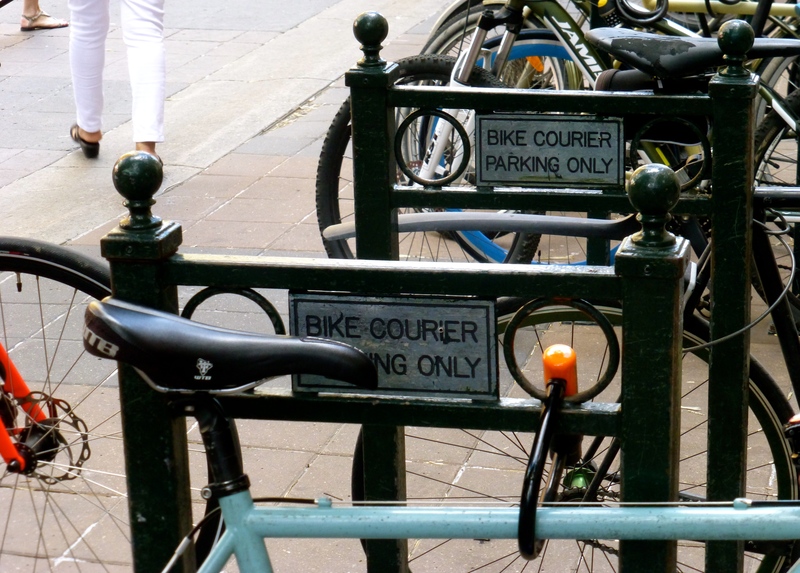 Niemand schien Fahrradfahrer zu mögen, obwohl wir so gut wie die einzigen waren, die hier etwas aßen – ob gut oder schlecht – und viel Geld für Campingplätze bezahlten, die so gar nichts boten. In einer besonders abgelegenen Gegend hielten wir an einem Campingplatz, um unsere Wasserflaschen aufzufüllen. Leider durften wir nicht, wir sollten Wasserflaschen kaufen, denn das Wasser aus den Wasserhähnen sei nur für Gäste. Wir gingen ohne Wasser und verärgert, da es gegen unsere Prinzipien ist, Plastikflaschen zu kaufen, wenn Trinkwasser reichlich vorhanden ist. Und es geht uns hier nicht um’s Geld. An der Bürotür hing übrigens dieses Schild: “Wenn Sie einen Bären sehen, kommen Sie nicht in mein Büro.” Das sagt schon alles! Später füllten dann deutsche Touristen unsere Wasserflaschen und wir stellten unser Zelt an einem kleine Bach auf, in dem wir uns auch wuschen. Essen gab’s an einem wärmenden Lagerfeuer und müde verkrochen wir uns später in unsere Schlafsäcke. In diesem Teil der Welt gibt es noch kaum Verkehr und wenn, dann handelt es sich um Touristen oder Versorgung-LKWs aus oder nach Alaska. Das machte das Radfahren trotz Highway für uns sehr angenehm. Leider bestand die Strecke aus vielen Baustellen und wir wurden dort dann oft ziemlich eingestaubt. Schlimmer war allerdings, dass wir auf Teilstrecken nicht mehr selbst fahren durften, sondern unsere Räder auf einen LKW laden mussten. Zu gefährlich! Beim ersten Mal versuchten wir noch zu verhandeln, merkten aber schnell, dass wir chancenlos waren. Anstelle mussten wir 20 Minuten warten, bis Feierabend war. Amerikaner – auch in Kanada – haben immer Angst, verklagt zu werden falls etwas passiert. Eines Morgens, als wir unser Camp verließen, wohlwissend, dass es die nächsten 200 Kilometer nichts anderes gibt als Bäume, Berge und Bären sahen wir plötzlich ein Paar rote Gebäude in der Ferne. Als wir näher kamen, sahen wir ein Schild mit der Aufschrift “Creperie” und dachten, das muss entweder eine Fata Morgana sein oder ein Relikt aus früheren Zeiten. Aber nein! Es handelte sich tatsächlich um eine französische Bäckerei irgendwo im Nirgendwo, in der französische Leckereien, Brot und natürlich Crepes verkauft wurden. Obwohl wir gerade erst gefrühstückt hatten, konnten wir es uns nicht verkneifen, nochmals zuzuschlagen und gönnten uns ein leckeres zweites Frühstück. Mittlerweile fragt ihr euch sicherlich, warum wir überhaupt noch Campingplätze aufsuchen, anstelle irgendwo in der Wildnis zu zelten. Dafür gab es einige Gründe: Erstens fühlten wir uns auf Campingplätzen vor Bären sicherer als in der freien Wildbahn. Zweitens bekamen wir immer Wasser von anderen Reisenden und mussten das Wasser nicht aus den Flüssen filtern und trotzdem riskieren, krank zu werden. Der dritte und wichtigste Grund war für uns, dass wir unsere Essenstaschen und Toilettenartikel wie Zahnpasta nicht außer Reichweite von Bären in Bäume hängen mussten. Das wäre übrigens sowieso fast unmöglich gewesen, da die kargen Tannen keine geeigneten ausreichend starke Zweige hatten. Auf den Naturcampingplätzen gab es meist spezielle Schließfächer, in denen wir unser Essen bärensicher wegschließen konnten. Wenn nicht, ließen sich die bärensicheren Abfallbehälter immer von hinten öffnen, wo wir dann unsere Sachen verstauten. Ohne irgendwas im Zelt außer zwei müffelnden Radfahrern, Bärenspray auf beiden Seiten und Feuerwerkskörper, die Johan geschenkt bekam, schliefen wir meist relativ gut. Die meisten staatlichen Campingplätze oder sogenannten Naturcampingplätze waren immer landschaftlich wunderschön gelegen. Tolle Aussichten, fast immer an einem See oder Fluss, allerdings immer ohne Duschen. Dafür gab es Plumpsklos und Feuerstellen mit Feuerholz. Meist musste das Geld in einen Umschlag und dann in einen Briefkasten gesteckt werden – in der Regel bezahlten wir zwischen 10 und 15$. Einige der Geschäfte am Highway waren dann doch besonders gut – und dann auch total überfüllt. Exzellenz spricht sich eben rum. Und wir haben natürlich auch tolle Menschen getroffen. Zum Beispiel unsere WarmShowers Gastgeberin Sue aus Whitehorse, bei der wir einige Tage bleiben durften und mit der wir eine Kanufahrt machten. Bei einem Treffen mit ihren Freunden lernten wir Dee kennen, eine Künstlerin, die mit Ton arbeitet. Wir luden sie spontan am nächsten Tag zu Sue zum Frühstück ein und sie zeigte uns ihre Kunstwerke. Wer sich für ihre Arbeit interessiert, kann gerne mal hier reinschauen: http://www.DBaileyArt.com. Und dann gab es da noch den Amerikaner in Ruhestand, der einfach nur so anhielt, um zu fragen, ob wir etwas nötig hätten. Oder einige andere Amerikaner, die uns spontan zu sich nach Hause einluden, wenn wir dann wieder in den USA sind. 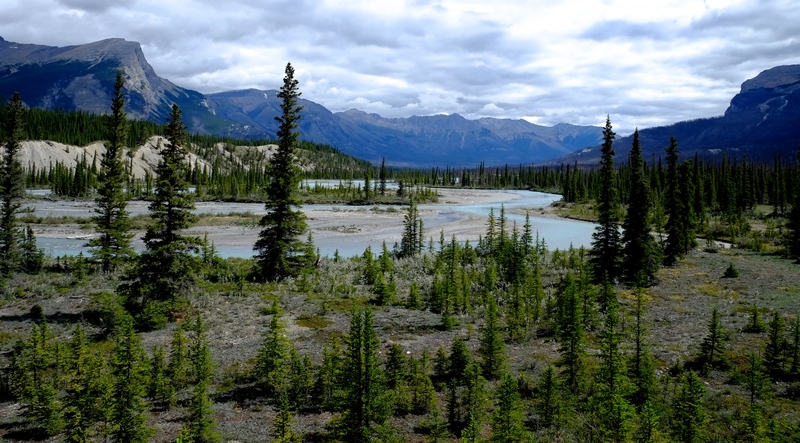 Nach vielen Kilometern durchs Nichts und etwas weniger spektakulären Landschaften und nach der Überquerung der nördlichen Rocky Mountains freuten wir uns auf Watson Lake, das auch als das Tor ins Yukon (von British Columbia aus gesehen) bekannt ist oder für seinen Schilderwald. Wir hielten am ‘RV Park’, um nach einem Zeltplatz zu fragen. Wir bekamen die unfreundliche Antwort: “Keine Zelte.” Da uns keine anderen Campingplätze bekannt waren, fragten wir, ob wir denn gegen Bezahlung duschen dürften, aber auch das war nicht möglich. Auf unsere Frage, warum er denn so unfreundlich sei, bekamen wir die Antwort, dass er Zelte nicht ausstehen könne, vor allem aber Radler, da diese ihre Essenstaschen immer außerhalb des Zeltes aufbewahren würden. Ja, natürlich. Was sollen wir denn im Bärenland machen, wenn es keine Schließfächer für Essen gibt? Zum Glück fanden wir noch einen anderen Campingplatz, versteckt hinter einer Tankstelle mit sauberen Duschen und Toiletten und sogar nagelneuen Waschmaschinen. Hier trafen wir ein älteres Ehepaar, das direkt neben uns parkte, ohne bei Ankunft auch nur einen Ton zu sagen. Später entschuldigten sie sich für ihre schlechte Laune, schließlich hätten sie 700 Meilen hinter sich. Am nächsten Tag erzählten wir ihnen, dass wir so enttäuscht über die Unfreundlichkeit der Menschen seien. Niemand spricht mit dem anderen, alle bleiben unter sich und interessieren sich nur für sich selbst. Wir erzählten auch, dass wir sehr verwundert waren, dass so gut wie nie jemand halten würde, um zu fragen, ob wir etwas bräuchten, Wasser zum Beispiel. Sie sagten uns dann, dass sie auch nie für jemanden halten würden, auch nicht für Radfahrer – man könnte sie ja erschießen. So eine Antwort kann nur von einem US-Amerikaner kommen. Uns kam es so vor, als würden alle Amerikaner in Angst leben. 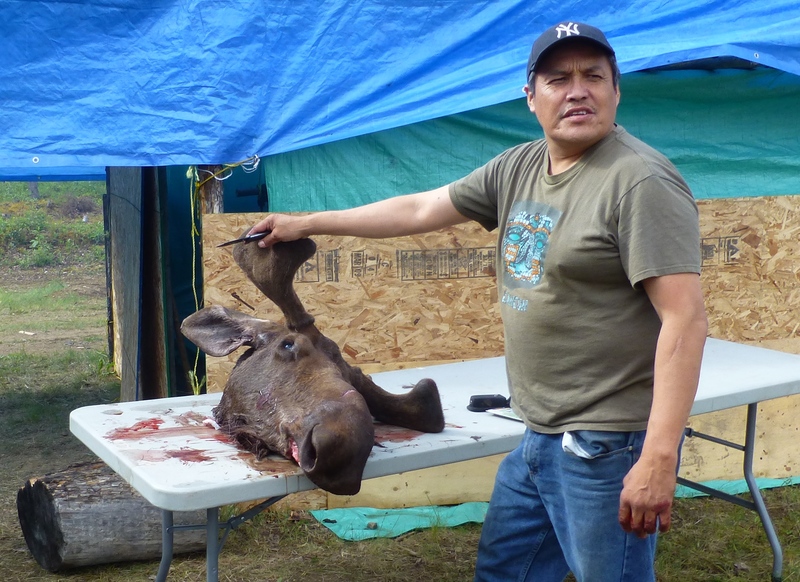 Alaska: Where have all the bears gone? 27 April – 27 May, 2016 – Bridging the winter in Thailand hasn’t been our smartest idea ever. First, it was far too hot in Thailand to enjoy cycling and second, a 30-degree-temperature difference didn’t make our acclimatization much easier. We would feel cold for weeks. 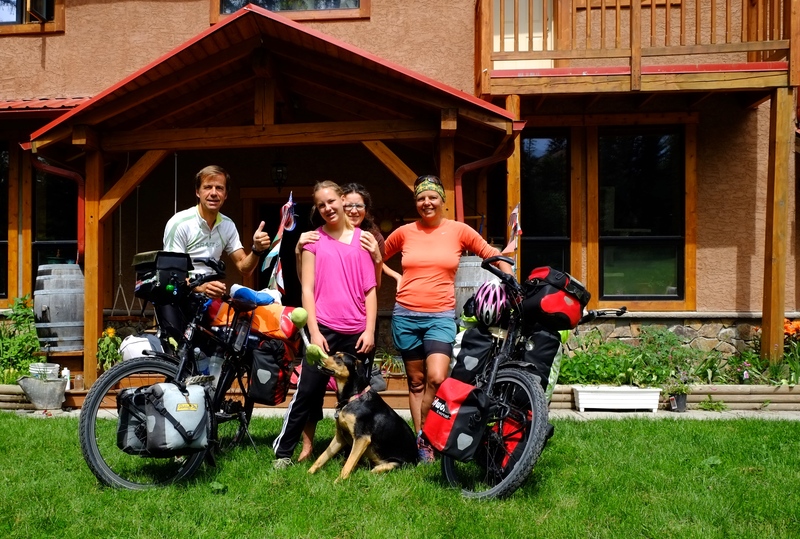 Thankfully we were warmly welcomed by the wonderful and a bit chaotic Lowe family in Anchorage who didn’t mind us staying longer than planned to get used to the time difference and the idea of cycling at for us still winter temperatures. 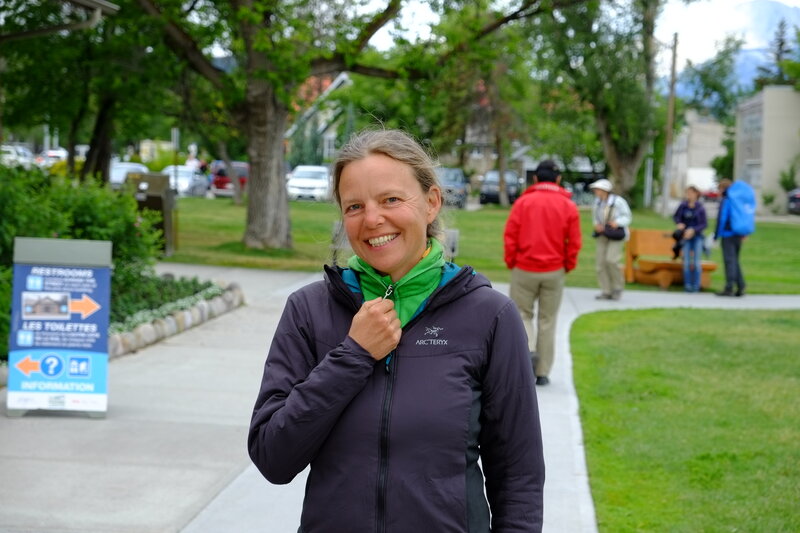 We upgraded our gear, walked the dogs of our hosts, cycled around Anchorage, enjoyed yummy food and a different breakfast almost every day, ate Sushi with the lovely neighbors, were taken to the Exit Glacier and Steward, and participated in a bear awareness training. You would expect that one feels better prepared and less anxious after such a training. Failed! 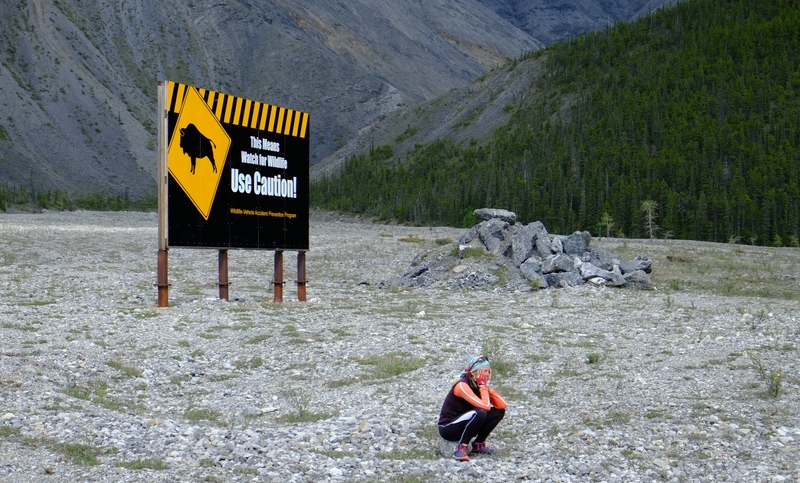 We now knew how to handle our bear spray, we knew we had to “stand the ground” if a bear would charge and that most charges were bluff charges and the bear turns away a meter before you. We even learned to fight back when a bear starts eating us or if a bear would attack our tent in the middle of the night. REALLY? 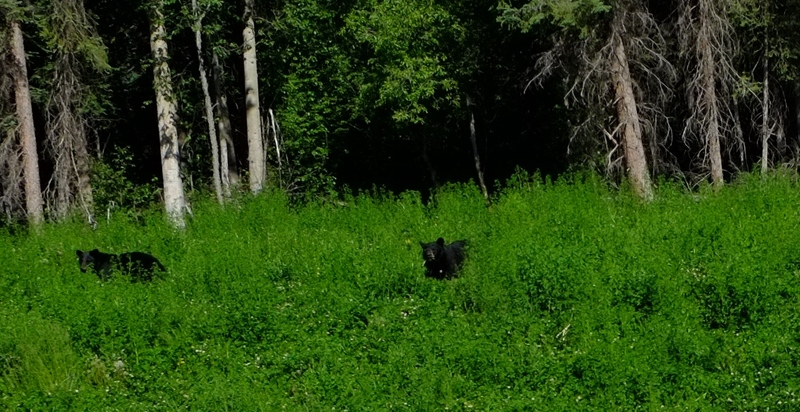 We both were more afraid than ever of potential bear encounters and now felt like there was a bear behind every tree and after every corner of the road. However, it is still more likely for us to get hit by a car than charged by a bear. 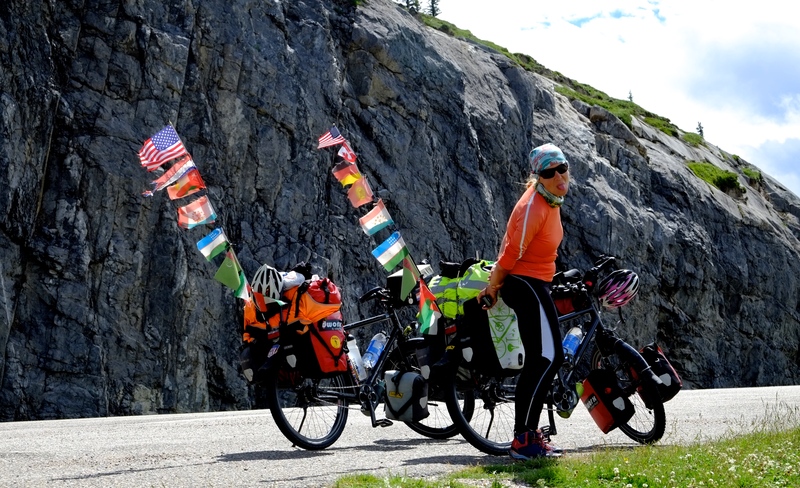 After 10 days we were finally ready to start pedaling – mentally as well as physically. Leaving was hard this time as we felt like losing our family – the downside of long-term travelers. A sleeping gentleman in front of the Sleeping Lady (name of the mountain in the background). She will only wake up when there is peace on earth everywhere! Thankfully Johan woke up earlier. 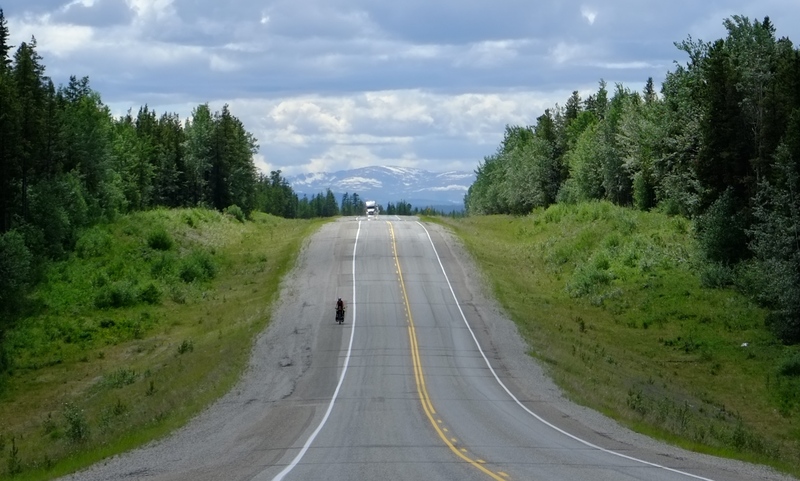 Cycling Alaska in early May means cycling pre-season and lots of campgrounds and other even more important facilities such as grocery shops along the way were still closed. 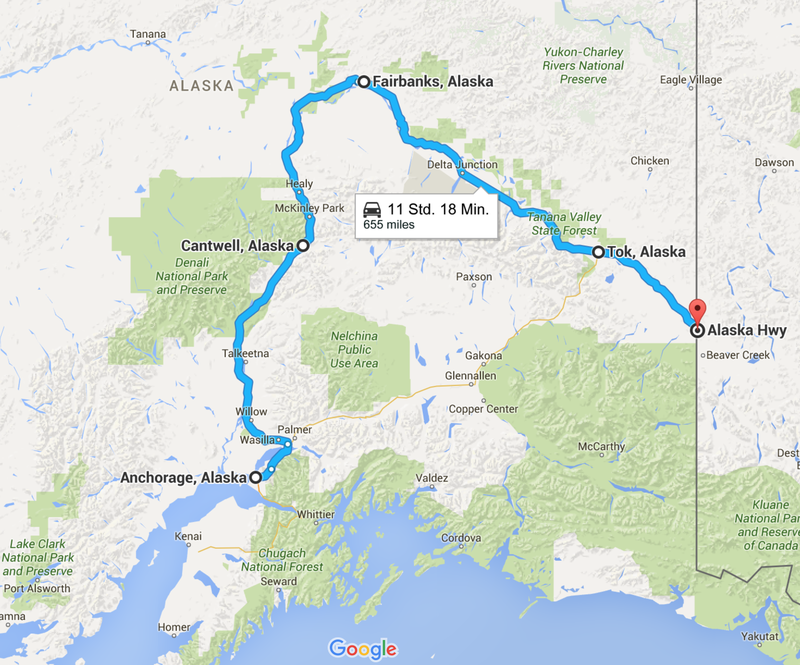 We left Anchorage heavily overloaded as our new family was afraid we would starve on the way. 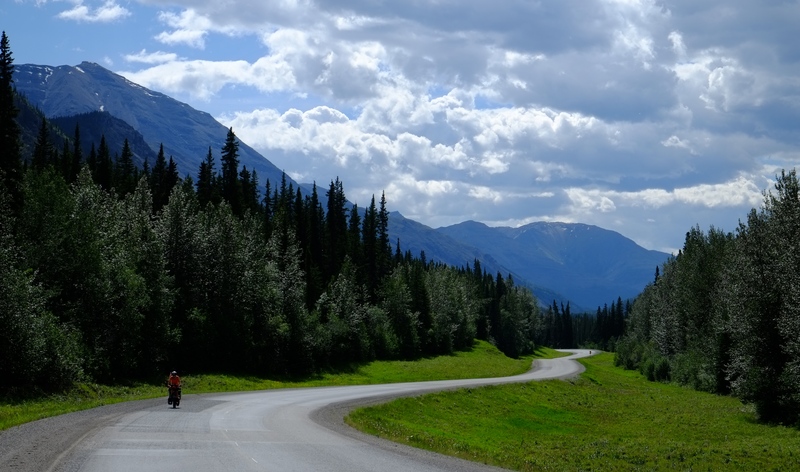 We chose to cycle the George Parks Highway to Fairbanks and from there the Alaska Highway to Canada. 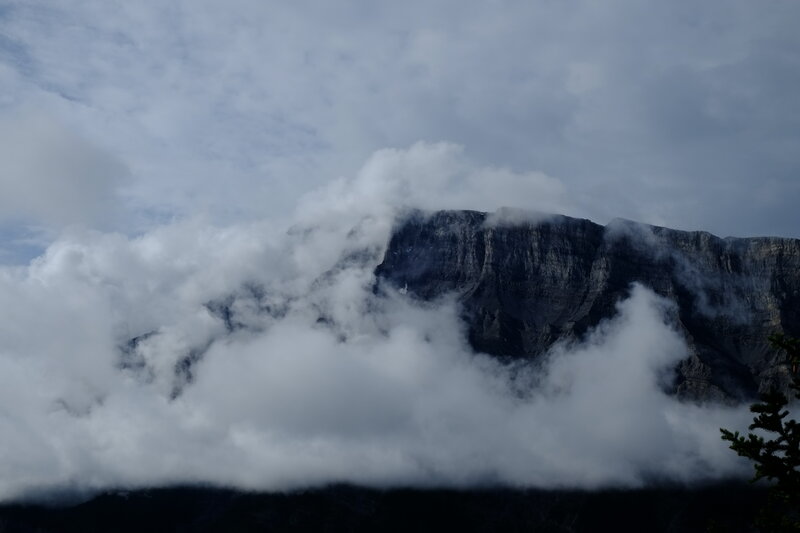 Weather at this time of the year is very unstable with chilly temperatures, sometimes snow and lots of rain. Forecasts are useless as the weather changes so quickly that they are mostly unreliable. Luckily we found a few more hosts on our way so we could get some shelter from the rain and cold, the one or the other nice warm meal and the often desperately needed hot shower. Shortly after Anchorage we were able to stay with an older lady living on her own with 13 sled dogs in the middle of nowhere. Last year a huge fire destroyed the forest around her house together with her greenhouse and a shed. Thankfully her beautiful house overlooking the vastness of forests and mountains stayed untouched by the flames. Due to heavy rains we were able to stay another day at her little cabin next to the house and dogs, entertained her with our road stories, listened to her life stories. In return for her hospitality we cleaned her house and Johan became friends with her dogs and fed them as well as cleaned their area from poop. 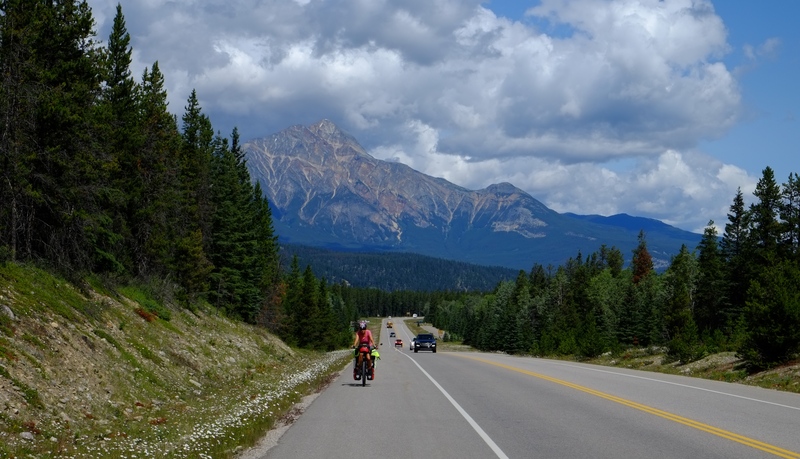 We continued cycling through rolling hills and endless forests and enjoyed fantastic vistas of snow-capped mountains and a myriad of lakes, if rain allowed. We camped at an abandoned lodge, always afraid we would wake up with a gun pointed at us as we had trespassed private property. At Denali National Park I celebrated my birthday and we admired North America’s highest peak, this time at fantastic weather. James and Amanda, our hosts at Denali, invited us that evening for a yummy dinner followed by drinks at a nearby bar with live music. 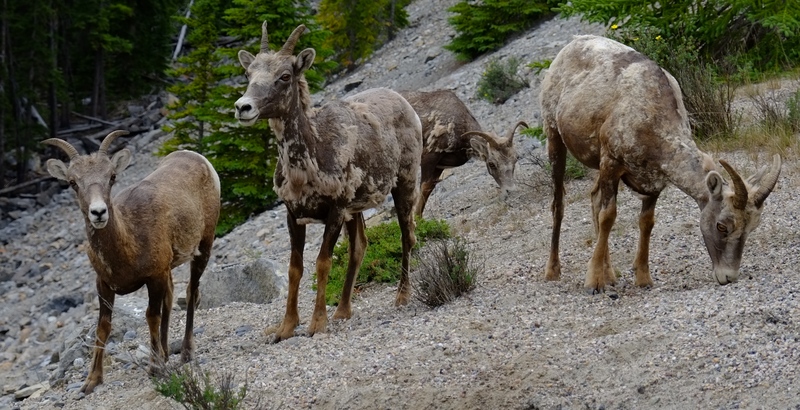 We still hadn’t spotted a single bear but instead moose and caribou. 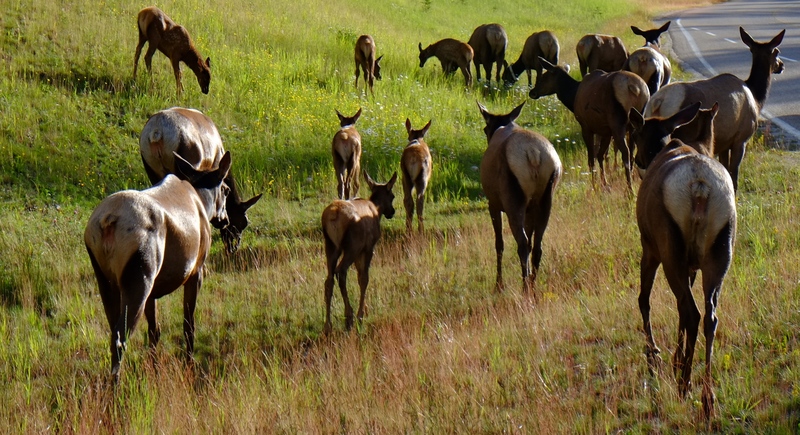 They would just graze next to the road and look curiously at us with their enormous heads. Strange enough we both are less afraid of these ungulates even though everyone keeps telling us that they are more dangerous than bears. 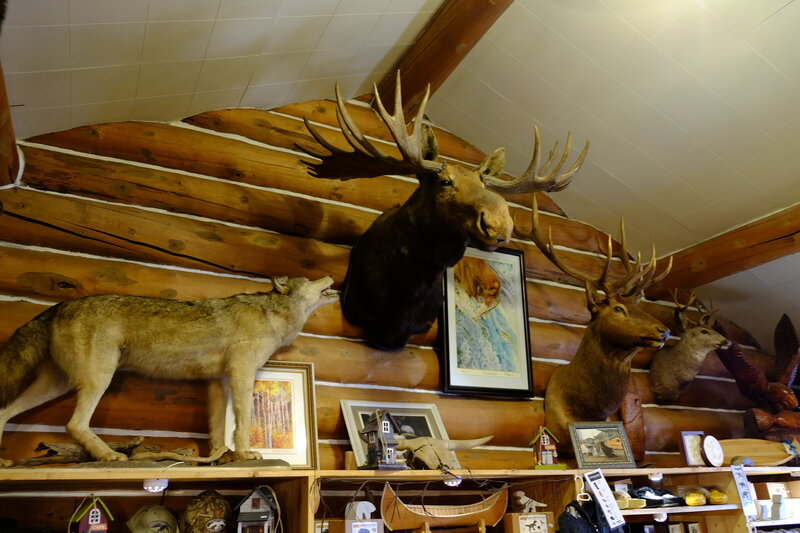 In Fairbanks we had an encounter of a very different kind: we met the real Santa Claus. He lives in North Pole and happened to be the brother of my former work colleague and decided to change his name into Santa Claus. At Christmas time he makes a lot of children very happy with his personalized letters and presents. 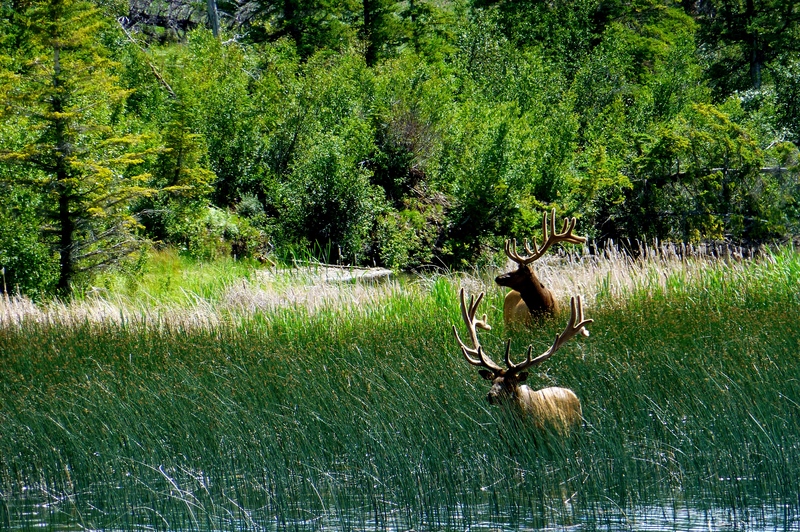 Remember the movie ‘Into the wild’? This day would continue with more unexpected surprises: our Anchorage family came to visit us and we camped together with their two children, two dogs, a chicken and a bunny. 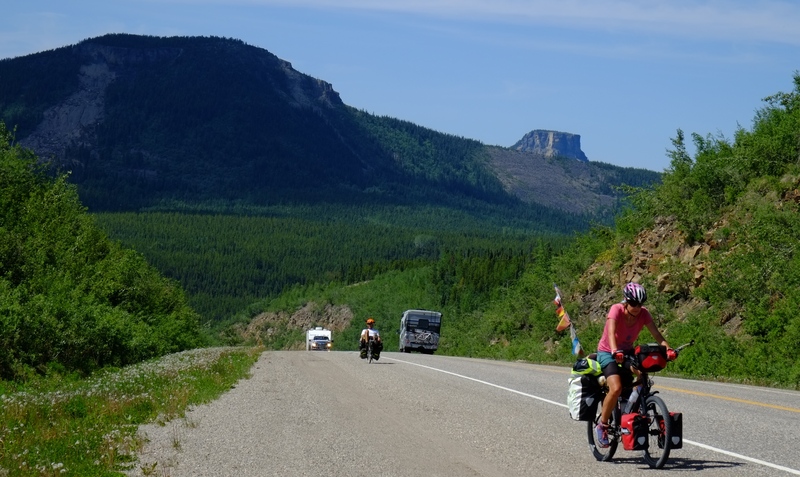 The next day little Omi decided she wanted to continue with us and we loaded all our luggage into the motorhome and flew with the wind 165 km further to our next campground. In the meantime the Lowe’s collected a Japanese cyclist on the way and upon arrival they spoiled us with delicious dinner. That night five adults, two children, two big dogs, a chicken and a bunny slept in a 6-person-motorhome as thunderstorms passed through. 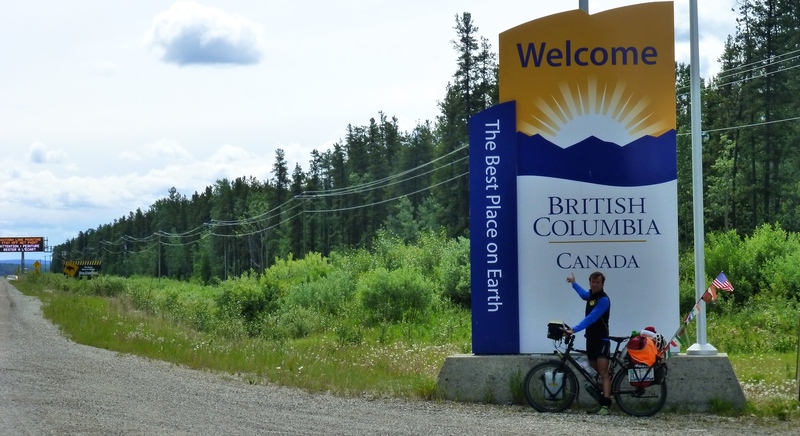 After another wonderful breakfast the following morning including fruit salad, pancakes, sausages, juices, coffee, tea, eggs and many more delicacies we bid our final farewell and continued cycling towards Canada together with Hiroki. 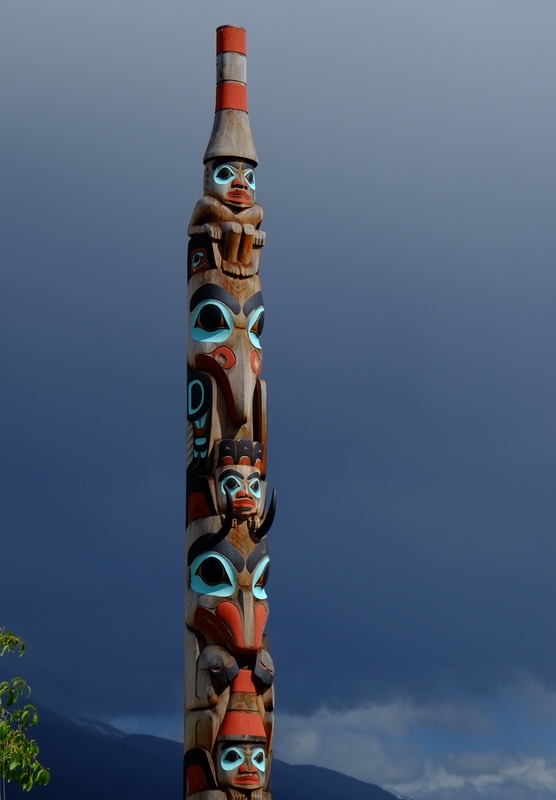 Alaska: Bären, wo seid ihr? 27. April – 27. Mai 2016 – Den Winter in Thailand zu überbrücken war nicht eine unserer besten Ideen. Erstens war es dort viel zu heiß zum Radeln und zweitens machte ein Temperaturunterschied von über 30 Grad die Eingewöhnung nicht einfacher. Uns war wochenlang nur kalt. Zum Glück wurden wir von den Lowes herzlich empfangen, wo wir länger bleiben konnten als ursprünglich geplant, um uns an die Zeitverschiebung und das Wetter zu gewöhnen. In Anchorage haben wir nochmals unsere Ausrüstung angepasst, sind viel mit den Hunden der Familie spazieren gelaufen, haben uns Anchorage radelnd angeschaut, haben lecker gegessen und bekamen fast jeden Morgen ein anderes Frühstück. Sushi gab’s bei den Nachbarn, und mit den Lowes sind wir nach Steward und zum Exit Glacier gefahren. Auch an einem sogenannten ‘Bärentraining’ haben wir teilgenommen. Man sollte annehmen, dass wir uns nach diesem Training gut gerüstet und sicher fühlten. Weit gefehlt! Wir wussten zwar, wie wir mit unserem Bärenspray umgehen müssen, wir wussten auch, dass wir stehen bleiben müssen, wenn ein Bär angreift, da es sich meist um Bluff-Angriffe handelt und der Bär normalerweise einen Meter vorher abdreht. Wir lernten auch, dass wir kämpfen müssen, wenn ein Bär beginnt, einen aufzuessen oder wenn er mitten in der Nacht unser Zelt angreift. ECHT? Jedenfalls hatten wir beide mehr Angst denn je vor Bären und sahen in den ersten Tagen unterwegs hinter jedem Baum und nach jeder Kurve einen Bären. Dennoch ist für uns die Wahrscheinlichkeit, in Alaska von einem Auto angefahren zu werden immer noch wesentlich größer, als von einem Bären angegriffen zu werden. Nach zehn Tagen fühlten wir uns endlich bereit, wieder in die Pedale zu treten – mental als auch physisch. Auch dieses Mal fiel uns der Abschied von der uns lieb gewonnenen Familie sehr schwer – aber so ist es eben als Langzeitreisender. Ein schlafender Gentleman vor der schlafenden Lady (Name des Berges im Hintergrund). Die Lady wacht erst auf, wenn auf der ganzen Welt Frieden herrscht. Zum Glück ist Johan früher aufgewacht. 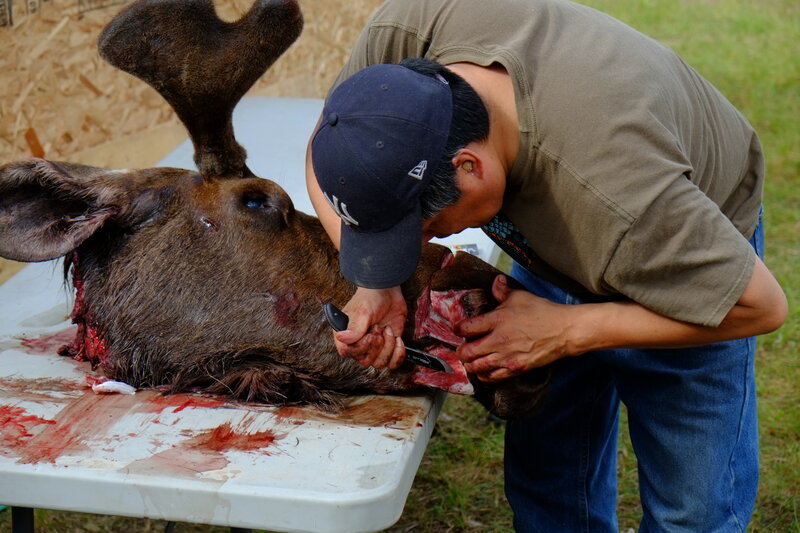 Anfang Mai in Alaska ist noch immer Vorsaison und viele Campingplätze und was noch viel wichtiger für uns war, viele Supermärkte sind auf dem wenig besiedelten Weg noch nicht geöffnet. Und so verließen wir Anchorage völlig überladen, da unsere neue Familie Angst hatte, wir würden unterwegs verhungern. 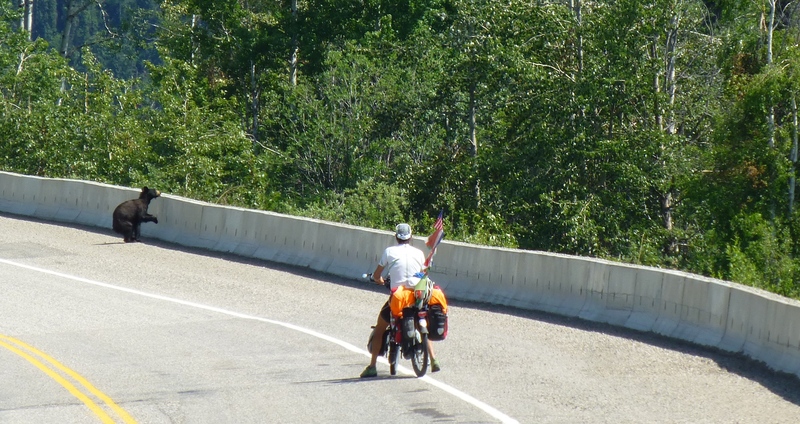 Wir fuhren auf dem George Parks Highway nach Fairbanks und von dort auf dem Alaska Highway nach Kanada. Das Wetter zu dieser Jahreszeit ist noch ziemlich instabil mit kühlen Temperaturen, Schnee und viel Regen. Wettervorhersagen sind völlig nutzlos, das Wetter ändert sich ständig. Zum Glück kamen wir auf dem Weg ab und zu bei lieben Menschen unter, die uns vor Regen und Kälte retteten und uns die ein oder andere warme Mahlzeit zubereiteten sowie uns die oftmals dringend notwendige heiße Dusche zur Verfügung stellen. Kurz nach Anchorage übernachteten wir bei einer älteren Dame, die einsam und verlassen mit ihren 13 Schlittenhunden irgendwo im Nirgendwo lebte. Letztes Jahr wütete hier ein Waldbrand, der den kompletten Wald um ihr Haus herum, ihr Gewächshaus und eine Scheune niederbrannte. Zum Glück blieb ihr wunderschönes Haus mit Blick über Wald und Berge verschont. Da es so schrecklich regnete, durften wir noch eine Nacht in der kleinen Hütte neben ihrem Haus bleiben, unterhielten sie mit unseren Erfahrungen und hörten uns ihre Lebensgeschichte an. Im Gegenzug putzten wir ihr Haus, Johan freundete sich mit den Hunden an und fütterte sie. Er entfernte sogar den ganzen Hundekot, da diese Hunde im Frühjahr und Sommer die meiste Zeit an der Kette sind. Danach ging es weiter über unzählige Hügel und unendliche Wälder. Wir hatten fantastische Aussichten auf schneebedeckte Berge und zahllose Seen, wenn es der Regen denn erlaubte. Einmal übernachteten wir in einer verlassenen Lodge, hatten aber die ganze Nacht Angst, mit einem Gewehr im Gesicht aufzuwachen, da wir ja immerhin Privateigentum betreten hatten. 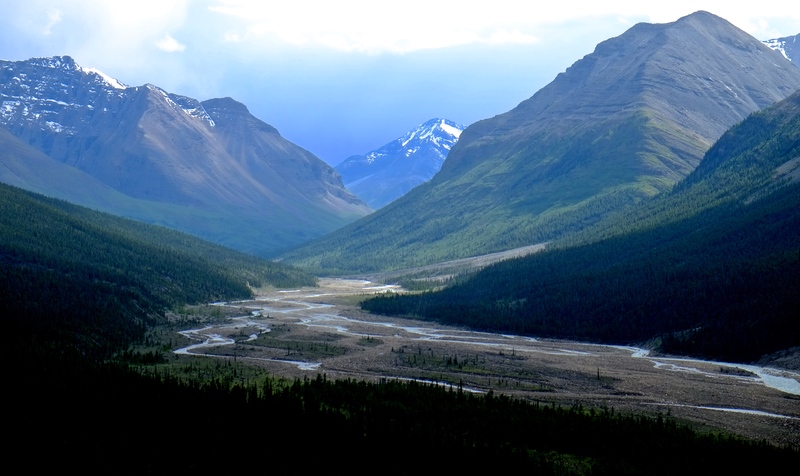 Im Denali National Park feierte ich meinen Geburtstag und wir bewunderten bei herrlichem Sonnenschein Nordamerikas höchsten Berg. James und Amanda, unsere Gastgeber in Denali, luden uns an diesem Abend zum Essen und in eine Bar mit Live-Musik ein. Noch immer hatten wir nicht einen einzigen Bären gesehen, dafür zahlreiche Elche und ein Karibu, die am Straßenrand grasten und uns neugierig mit ihren riesigen Köpfen beäugten. Komischerweise haben wir beide vor Elchen viel weniger Angst obwohl uns alle immer erzählen, dass sie viel gefährlicher und unberechenbarer als Bären sind. In Fairbanks hatten wir dann ein Treffen der ganz anderen Art: Santa Claus. Er wohnt in North Pole (Nordpol) und ist der Bruder eines ehemaligen Arbeitskollegen, der sich dazu entschieden hat, seinen legalen Namen in Santa Claus zu ändern. An Weihnachten macht er viele Kinder mit seinen persönlichen Briefen und Geschenken glücklich. Strömender Regen den ganzen Tag und dies war die einzige Bar auf dem Weg für ein heißes Getränk. … durften wir Santa Claus persönlich treffen. 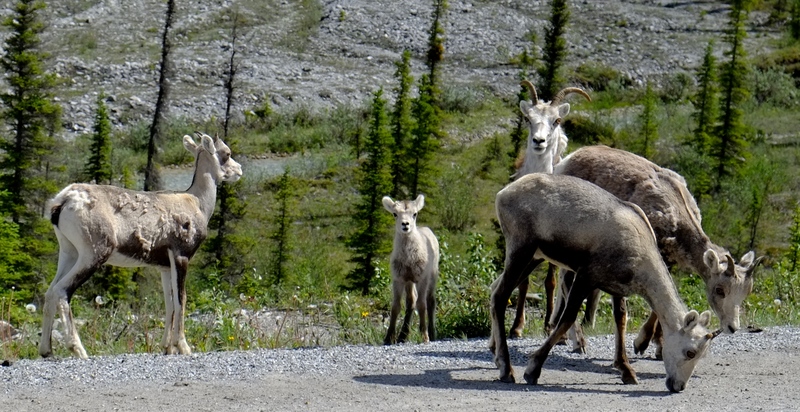 Dieser Tag sollte noch weitere unerwartete Überraschungen bringen: unsere Familie aus Anchorage kam uns besuchen und wir campten gemeinsam mit ihren beiden Kindern, zwei Hunden, einem Huhn und einem Hasen. Am folgenden Tag wollte Omi noch unbedingt weiter mit uns reisen und so luden wir all unser Gepäck in das Wohnmobil und flogen ausnahmsweise mit dem Wind 165 Kilometer weiter zum nächsten Rastplatz. In der Zwischenzeit hatten die Lowes unterwegs einen weiteren japanischen Radler aufgesammelt und am Ziel angekommen verwöhnten sie uns abermals mit leckerem Abendessen. In dieser Nacht schliefen fünf Erwachsene, zwei Kinder, zwei große Hunde, ein Huhn und ein Hase in einem 6-Personen-Wohnmobil, da heftige Gewitter angesagt waren. Nach einem ausgiebigen Frühstück am nächsten Morgen mit Pfannkuchen, Obstsalat, Eiern, Würstchen, Tee, Kaffee und Saft verabschiedeten wir uns zum letzten Mal von unserer Familie und radelten gemeinsam mit Hiroki in Richtung Kanada.